33012 at Salisbury after arriving with ECS to later form an additional 18.00 service to London Waterloo on 4 April 1988. 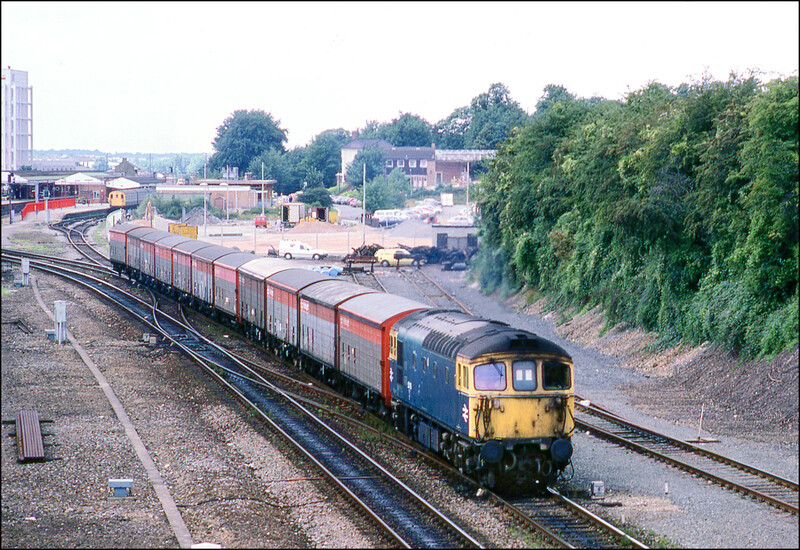 My interest in 33s was brought to life by seeing the Saturday morning Lawley Street - Southampton freightliner being hauled through Leamington Spa by members of this class in the early 1980s. The loco worked down the previous day on a Portsmouth Harbour to Leeds train and with no balancing passenger working was best utilised by working back to the Southern on this freight. 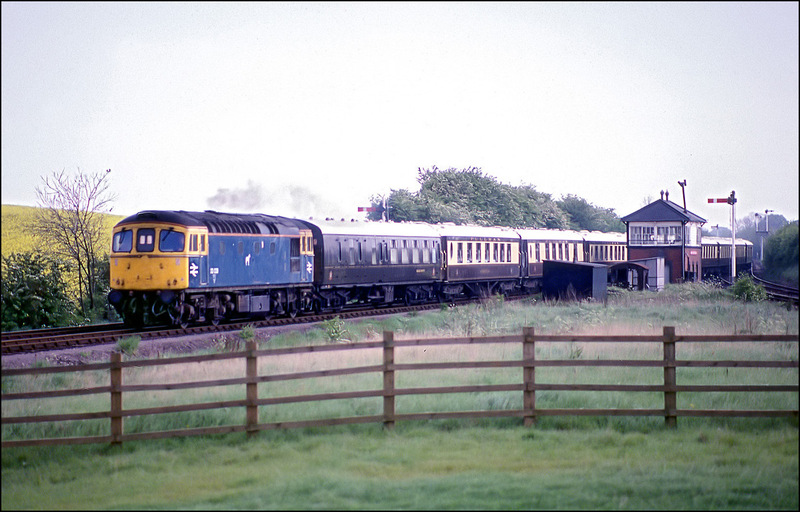 From 1987 to 1991 I took literally hundreds of photographs of Cromptons and would travel miles to get a single image. As they still were largely to be found on the south-east and south-west divisions of the region it meant that I found myself in parts of the country I would probably not otherwise have visited. It was not only Cromptons that I photographed, of course, and plenty of other locos were pictured along with 3rd rail multiple units. I had my "slammer" pictures when they were all over the southern so I haven't felt the need to charge around in recent months to obtain my pictures. The highlights of my travels were the Channel Tunnel construction trains which were almost exclusively in the hands of pairs of 33s. 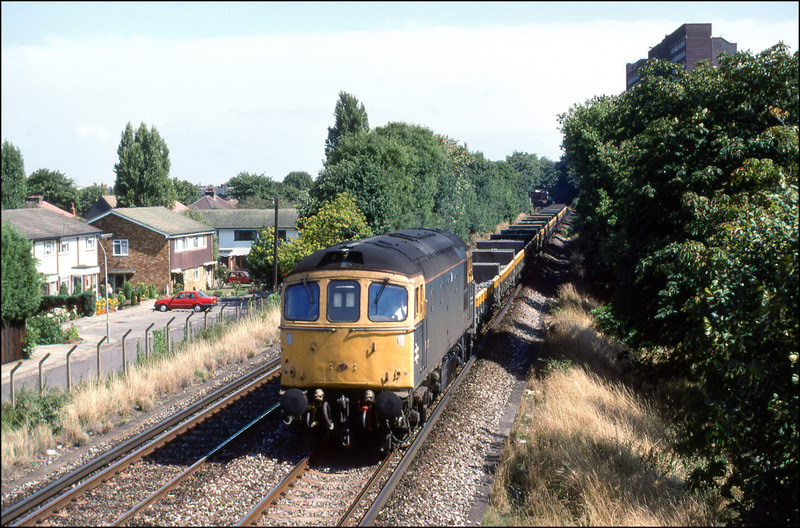 I particularly enjoyed photographing on the Sidcup Loop because it was possible to obtain pictures showing the train in the suburban environment. 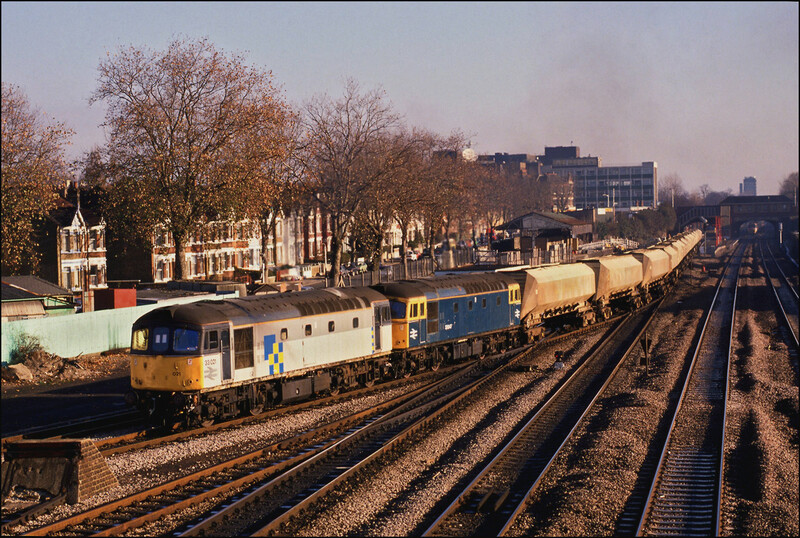 In 1989 there were at least two departmental workings from Woking Yard to various locations around London. It was not always possible to identify individual workings but the attraction at the time was that they were absolutely solid class 33 turns. 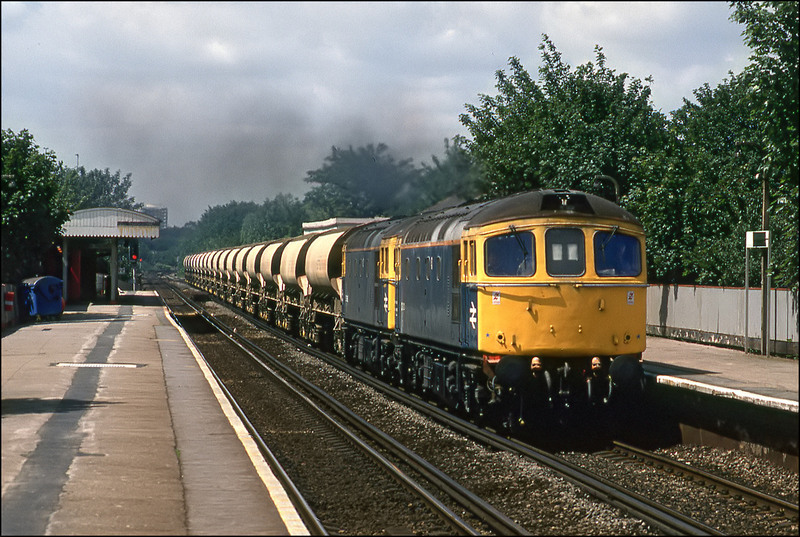 Here is 33030 passing Chertsey with the afternoon return to Woking, but from where I don't know, in June 1989. In retrospect the framing of the original transparency was not quite right but I recall that the footbridge on which I was standing was a bit awkward and so some post-processing cropping and re-shaping was necessary. Although this picture and the one following show a class 73 leading a 33 I've put the images here because the point of the workings were to test the experimental bogies fitted to 33115 (83301). The shot shows the train standing in Basingstoke station on 1 May 1990 before it ran towards London, possibly Clapham Junction. The bogies under the Crompton were being tested for use on some Channel Tunnel vehicle although my notes (of course) don't give any more detail. 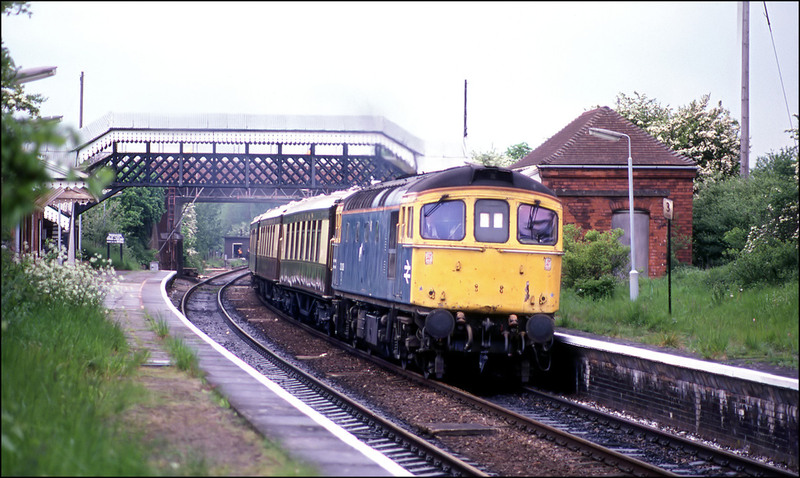 This picture shows the same train later in the same day, 1 May 1990, but this time at Winchfield. 2 stops further up the line from Basingstoke. I chose this location because it was a nice clear shot and was recognisable with the road bridge and wood in the background. 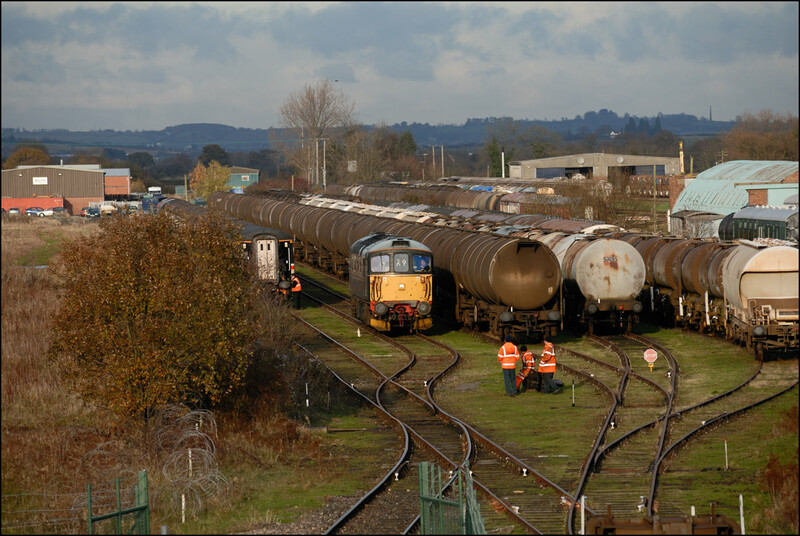 One of the most unusual moves to Long Marston took place on 19 November 2007. 33103 took long-withdrawn 56021 and 56011 with some barrier wagons, 5 coaches to provide brake force and 2 Megafret flats from Chaddesden to Long Marston as 6V33. 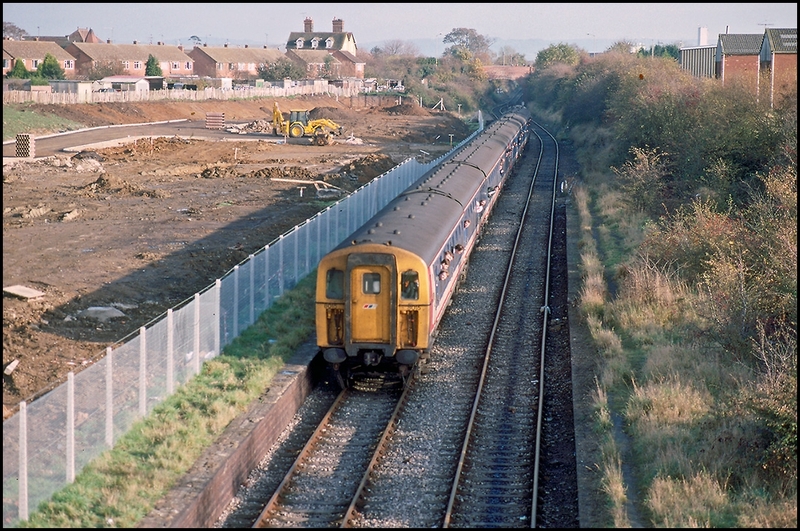 The 56s, flats and coaches, apart from the intercity example and 4 ex-Wessex trains, had been taken from storage at Mantle Lane, Coalville the previous week. The locomotives were in a deplorable state after vandalism at Coalville, including graffiti and missing windows, looking barely fit to travel by rail. Here is the odd-looking consist passing Evesham signalbox about 30 minutes late. 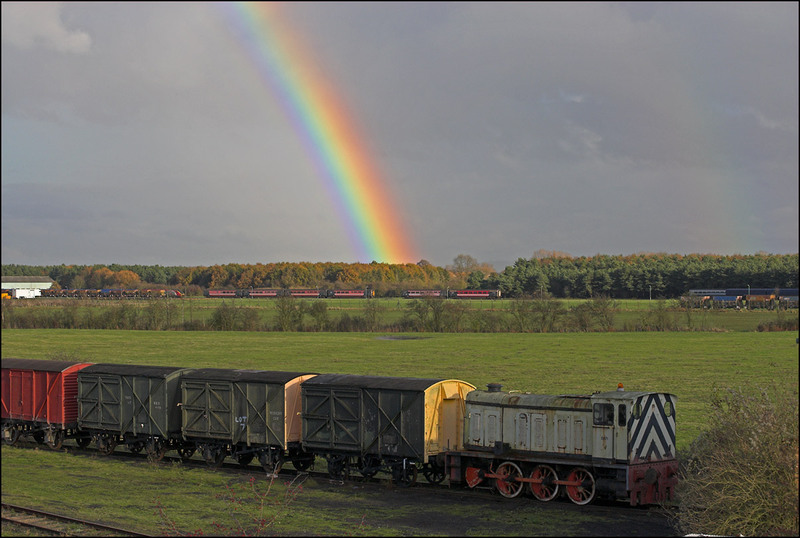 Sod's Law operated as 6V33 arrived at Long Marston on 19 November 2007; the sun came out at exactly the wrong time and given the time of day shone straight down the line and into my lens. The only saving grace was that it was just high enough in the sky not to in the picture so avoiding a lot more lens flare than would otherwise have been the case. I thought it worthwhile to include this image in view of the exceptionally rare nature of the event. On arriving at Long Marston to get another shot of 33103 with 6V33, I hoped that the sun would be behind clouds as at that time of day it shines directly down the line and into the camera lens for a train arriving from Honeybourne. Needless to say the sun came out just at the wrong time, hence the dodgy nature of my shot from the roadbridge shown above. Here is a closer-up view of the two 56s as they wait to gain entrance into Long Marston headed by 33101. To the best of my knowledge these are the first 56s to have used the branch from Honeybourne as the other example in the site came in by road. Class 33s aren't exactly commonplace either but have worked here on a railtour and on a few occasions in the 1960s on excursion traffic to Stratford-upon-Avon. 33103 was detached from the train and ran round the stock along No.2 road. In the meantime, 12082 took the 2 Megafret flats out of the way while the 56s and blue and grey stock were detached from the Intercity and Wessex-liveried stock. These 5 coaches were included in the train to provide brake force as the 56s and barriers were almost certainly incapable of providing any themselves. 33103 was then attached to the 5 coaches ready for the return trip. In the hope that the sun would stay out long enough to illuminate 33103 and its stock on the East Loop at Honeybourne, I made the 5 minute journey across country to the station. Unfortunately, dark clouds rolled in before the train arrived and the light dipped to almost impossibly poor levels. Just as I took this shot in the last vestiges of daylight, the heavens opened and I scurried away to the shelter of my car in the adjacent station car park. Just a couple of minutes passed before 33103 drew into the platform, picked up the men who had operated the ground frame, before heading off towards Evesham and Worcester. The dots visible over the hill in the background are not caused by dirt on my camera's sensor but are actually a flock of fieldfares, a member of the thrush family which comes to Great Britain from Scandinavia for the Autumn and Winter. The continuing saga of WCRC's 57313 at Stratford-upon-Avon finished on Saturday 6 October 2018 when 33207 was sent from Southall to collect and take it to Carnforth. The schedule for 0Z51 appeared during the previous evening and whilst I sort of hoped that a 33 would be diagrammed for the novelty value of a class 33 at Stratford it didn't seem all that likely. An early morning posting confirmed the allocation and despite the pouring rain and cold wind I walked to the station for a shot or two. 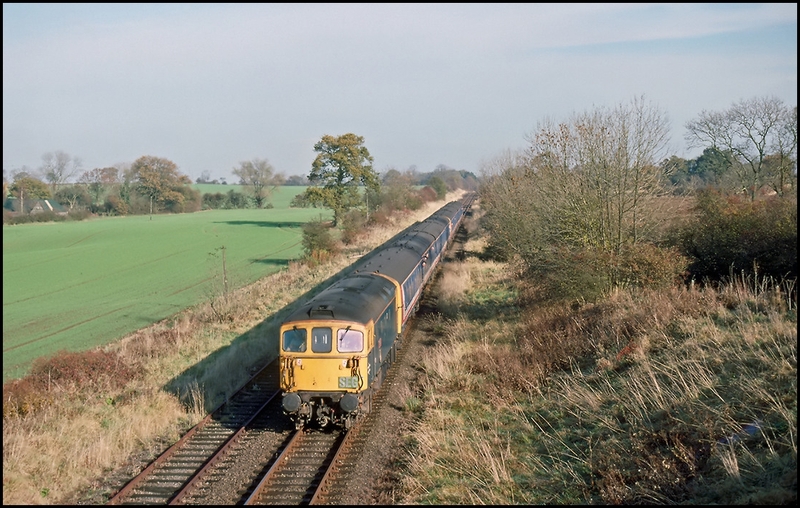 There was early running between Oxford and Hatton and I thought that with some smart working it could arrive before the 09.03 Stourbridge Junction via Dorridge service needed the single track between Bearley and Hatton West junctions. It wasn't to be so I had a chilly wait in the basic shelter on platform 2 until a horn announced 33207's presence just around the corner. The light was dire but considering the minimal effort needed to be here it was worth the walk. The failed 57313 was stabled just beyond the end of platform 1 and had necessitated the closure of the platform to all traffic. It wasn't long before 33207 had coupled up to the class 57 but there were 2 local trains to arrive and depart before it was due to leave. Once the 10.03 to Stourbridge Junction had gone 0Z51 was moved along platform 1 under a yellow signal where the driver kindly paused for a few seconds to allow me to take some shots with bracketed exposures before pulling away. This final image shows the pair of locomotives heading for the crossover onto the up main line. 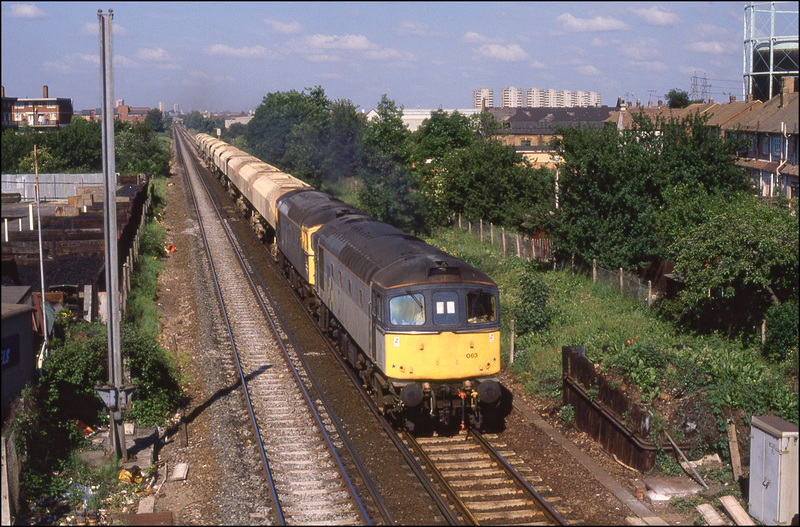 I am not certain about the identity of this train, pictured on the GWR main line at Acton on 19 July 1989. My best guess is that it is a rare working of the Halling to Greenford cement as the locos, 33023+33020 returned east light engines within a couple of hours. This shot nearly caused me serious injury at the very least. Behind me is a 6 lane inner ring road with a secure central barrier which, at the time had been rammed by a lorry leaving a small gap. I had been on the other side having just photographed 37888 climbing the bank with an oil train when I caught a glimpse of the 33s. There was no time to waste so I bolted across 6 lanes of traffic without incident only to come within a whisker of being collected by a motorcycle courier avoiding the traffic by riding on the pavement. This location is now completely changed with catenary for the Heathrow Express and various building developments. It's not very often that I can be bothered to scan any from my collection of thousands of slides taken in the 1980s and 1990s but on occasions I do have a go at one or two. 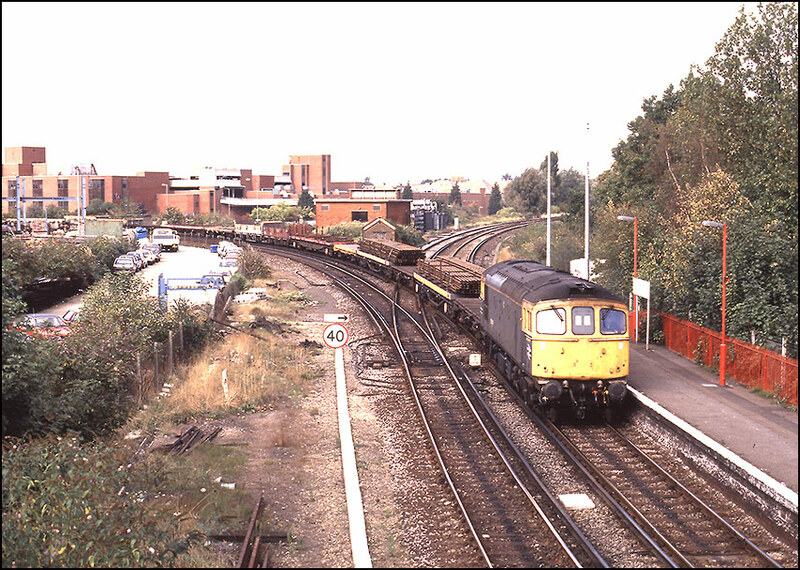 This is from a 35mm transparency taken at Basingstoke station on 10 September 1987 and shows 33010 leaving with an early afternoon Waterloo to Salisbury train. It's hard to believe that it's nearly 30 years since I was standing here with an Olympus OM1n photographing regular locomotive-hauled trains both from the main LSWR line and inter-regional expresses and freight from the line to Reading. 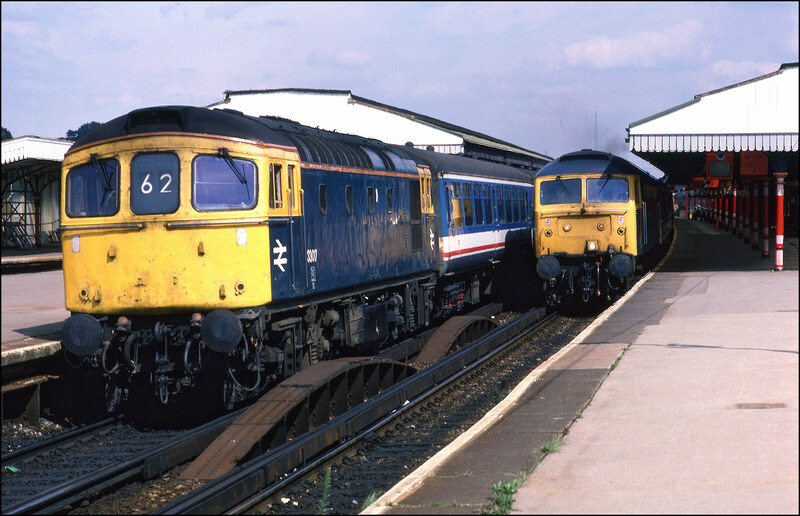 When I began to visit Basingstoke in 1987, class 33s were still very much in charge of the 2-hourly Waterloo to Salisbury services. Some trains were formed of 4TC stock hauled and propelled by push-pull fitted 33/1s and others utilised conventional hauled Mk 2 carriages. The latter is clearly in evidence here as 33017 sits in the station with the 14.10 from Waterloo as 47558 draws alongside with a down Poole service on 7 August 1987. Writing this in 2016 it seems hard to believe that there were so many locomotive-hauled trains on the network, most of which were comprehensively ignored by many enthusiasts because they were too commonplace to use a frame of film. 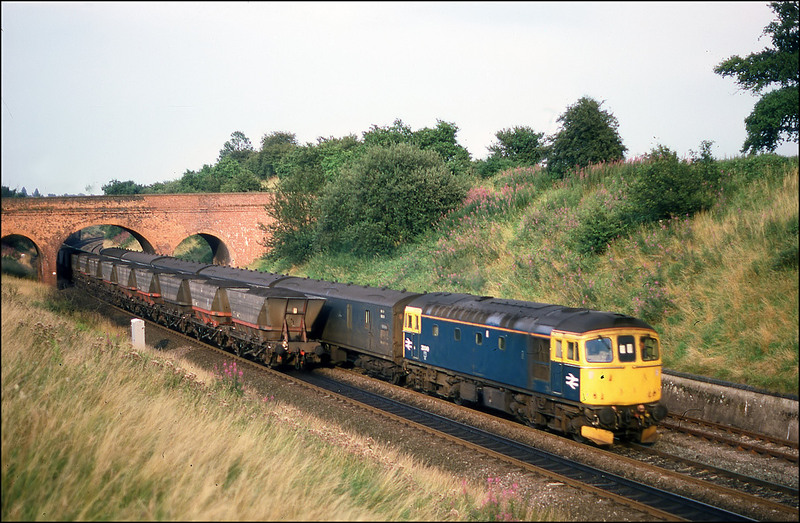 If a blue class 47 were to hit the main line these days there would be "galleries" on any available bridge. 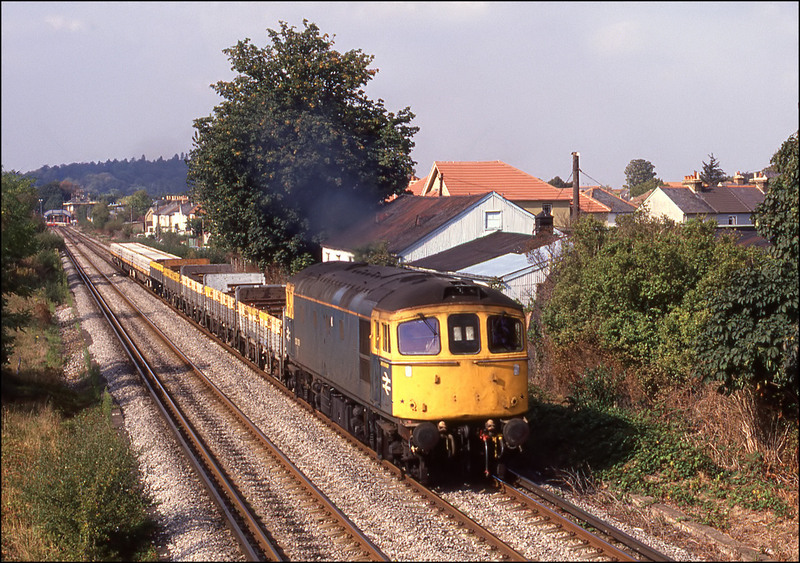 This photograph is dated 26 September 1987 and shows 33116 heading the down Bournemouth Belle near Worting Junction, Basingstoke. The train was timetabled and, from memory, ran every other Saturday, this run being the last of the 1987 season. 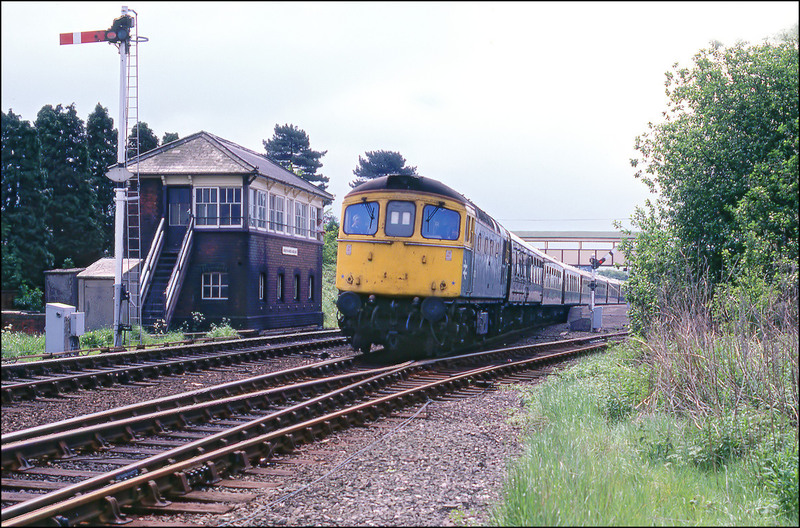 This was, and presumably still is a busy location, and on an average day in the 1980s one could photograph representatives of classes 33, 37, 47, 50, 56 and 73 along with DEMUs and a variety of third-rail electric units. A First Great Western power car, 43180, has been dumped in Worcester Shrub Hill's Long Siding for some weeks after, I think, a traction motor problem caused a seizure. A wheel skate was used to remove the car from its train awaiting a move to Old Oak Common for repair. 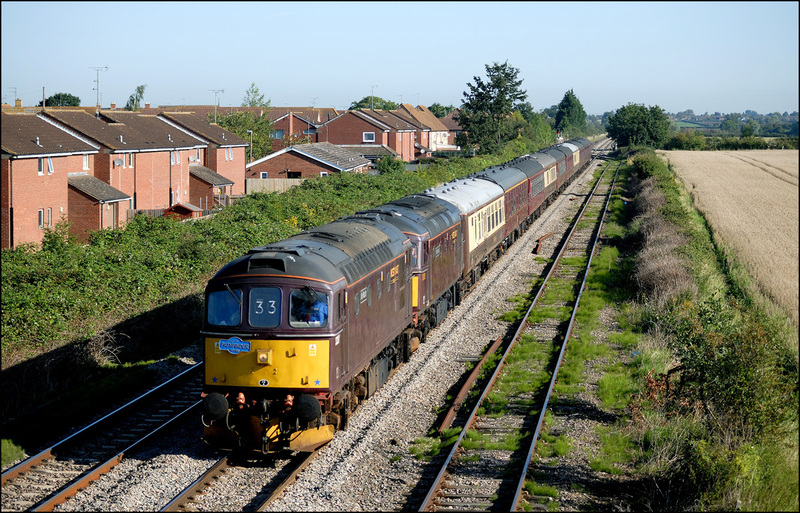 The first part of the move finally took place on Thureday 22 May 2014 when WCRC's 33029 and a barrier wagon were sent from Southall to Worcester, via the North Cotswold Line, to collect the errant power car and take it to Long Marston where, presumably, it will be much easier for it to be transferred to a road vehicle for the final leg of its journey. The train from Worcester, 8Z21, was limited to 10mph on plain track and 5mph over points and crossings and therefore took quite a while to reach Honeybourne where it came into view about 15 minutes late at 17.42. There was a nasty-looking thunderstorm approaching the station when I arrived but it moved around to the south-west and some brightness was apparent when 33029 brought its short train onto the Long Marston branch. The wheel skate can just be made out in this linked image. The time allowed for 33029 with 8Z21 to travel from Honeybourne to Long Marston wasn't much more than for any other train given the overall speed limit on the branch. I had time to drive round, park and walk over the public crossing to the field-side footpath before I heard the train coming round the curve from Broad Marston. The light wasn't nearly as bad as I had thought it would have been and a little patch of hazy sun appeared as the train ran into the only patch of track clear of vegetation. The locomotive and barrier coach left Long Marston for Southall a couple of hours later again running along the North Cotswold Line via Moreton in Marsh. My final shot at Hatton North on 29 May 2013 was of 33029 hauling 57315 and a single coach from Southall to Tyseley. I rarely bother with shots of these very short formations but thought that the colour combination of the two locomotives was odd enough to make a picture worthwhile, even in the foul conditions that were prevailing at the time. The train, 5Z57, ran early as far as Oxford and I had hoped that it would get a good run and avoid being held in the several loops that were shown in the schedule. This wasn't to be and it ran exactly as booked. This sort of situation is exactly where the admirable Realtime Trains website proves invaluable. It also provided the incentive that I needed to acquire a new smartphone, my old BlackBerry not being able to cope with the amount of data I was requesting! The class 33 was dropped off at Tyseley with the 57 and coach continuing to Carnforth. 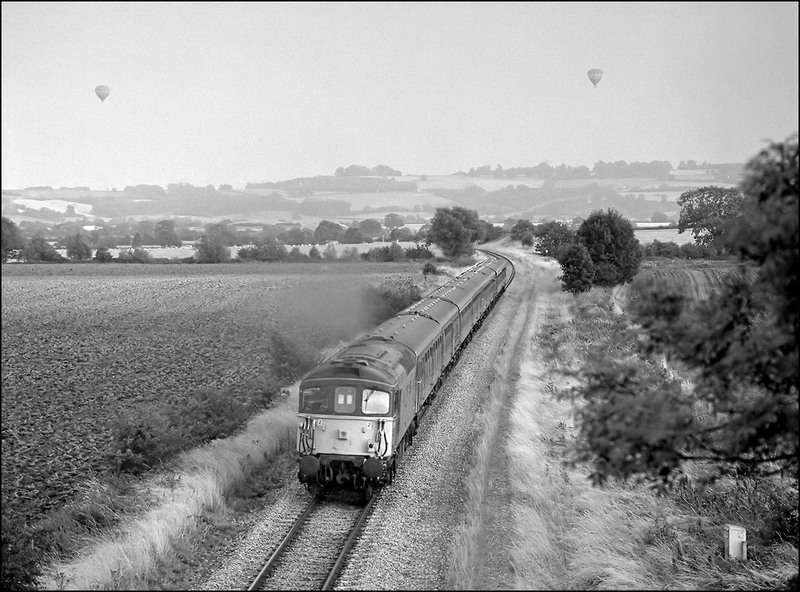 The first visit to Stratford-upon-Avon of the VSOE luxury train took place on 27 September 1984. 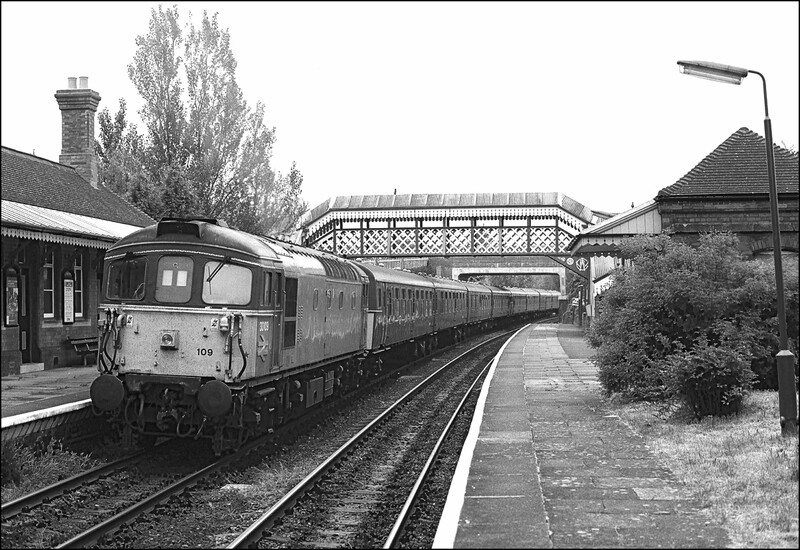 The rostered locomotive was 33204 and this was, I think, the first visit of a slimline class 33 to the town. The inward working is here seen about to pass under the roadbridge at Bishopton long before the fixed upper quadrant distant signal was replaced with a colour light further up the line and the bypas bridge, now so prominent in the background, was built. The quality of this and following two images is not good, being scanned from colour prints but I had run out of transparency film and didn't have time to go into town to buy a replacement so had to make do with what I had at home. The rarity of the working and elapsed time just about makes the images good enough to appear here. Once the VSOE had passed me at Bishopton I legged it down to the station at Stratford, arriving just in time to obtain this picture of it in the down goods loop. The train had been propelled from the arrival platform and the locomotive was about to be detached, run down the main line to the points to the north of the signalbox and back into the loop before propelling the coaches back into platform one before the whole departed as empty stock. As soon as the shunting moves had been completed, 33204 took the empty stock of the VSOE out of platform 1 at Stratford-upon-Avon and off to Tyseley for servicing. 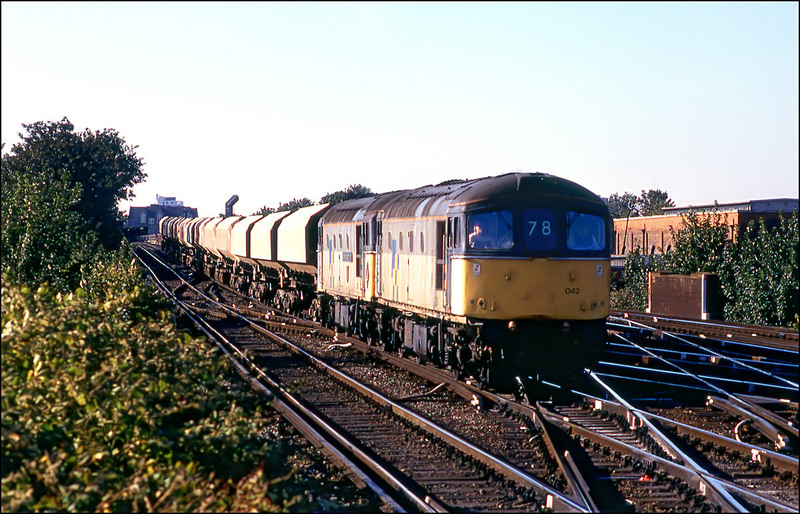 The train came back later in the day but the final departure for London Victoria was too late in the very poor light on 27 September 1984 to obtain a decent photograph. Stratford-upon-Avon has been a popular destination for the VSOE since it started running as a tourist train in the early 1980s. 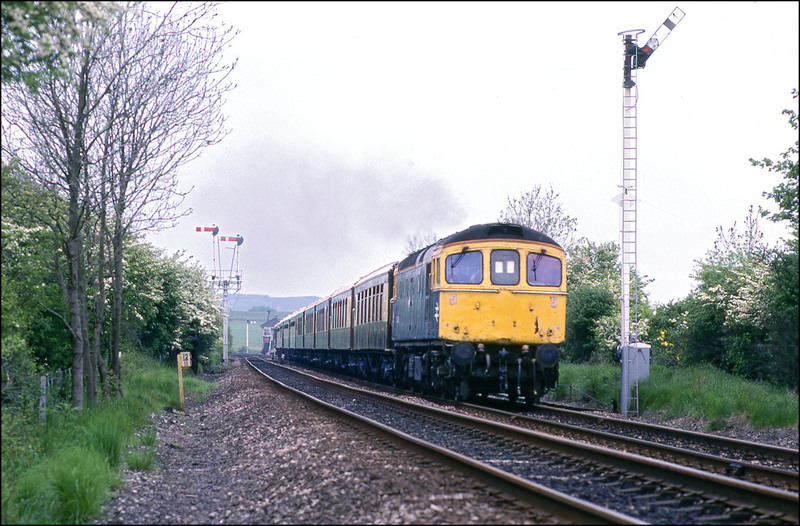 It regularly ran with class 33 power and here is 33028 passing Wilmcote station on 22 May 1987. It is interesting to see how unkempt the station then was compared to the model of tidiness it presents today. The weather was dreadful but the chance of a Crompton to this normally DMU-only outpost was too good to miss, especially the ECS was unusually booked via the North Warwickshire line to Tyseley for servicing. As mentioned above, 22 May 1987 saw the VSOE travel over the North Warwick line from Bearley Junction to Tyseley for servicing. Locomotives of any description are rare on this line but a 33 hauling the VSOE stock was huge! It was the first Crompton I was aware of to use this line since the route was truncated at Stratford in the 1970s. The train hauled by 33028 is seen here in the early afternoon passing the open signalbox at Henley-in Arden - these days it is switched out after the morning peak-hour shift and is due for closure and possible demolition towards the end of October 2010. 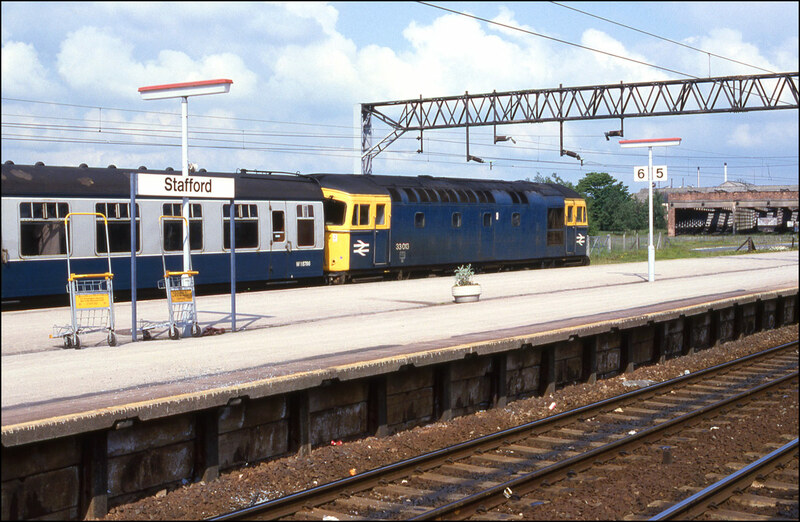 Once the VSOE stock had been serviced at Tyseley on 22 May 1987 the train returned to Stratford-upon-Avon ready to pick up its passengers for the return to London Victoria. I walked along the towing path of the nearby canal to a foot crossing so as obtain a shot of 33028 and the smart coaches passing the semaphore signals on the down side of Bearley Junction. The bracket signal protecting the junction still had lower quadrant signals at this time but were changed for those operating in the upper quadrant some time afterwards. They will all be removed in favour of colour lights by the end of October 2010 when control of the line is passed to the panel at Landor Street Junction, Birmingham. This view of Bearley Junction has not been possible for some time because of a proliferation of modern lineside equipment put there largely when the signalbox at Stratford-upon-Avon was demolshed and control of the terminus passed to a small panel in the box here. By the end of October 2010 this scene will have changed again with the removal of the GWR box (albeit with a Midland Railway frame) when the resignalling of the lines to Stratford is complete. 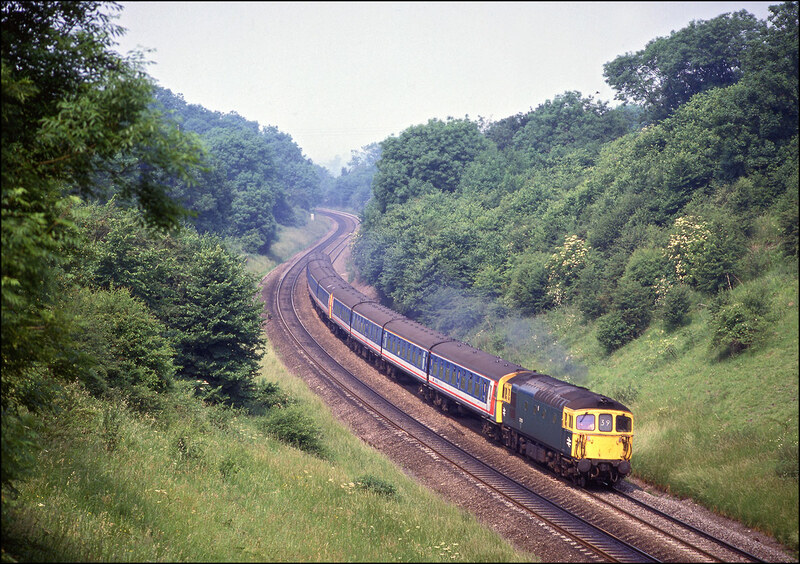 The VSOE hauled by 33028 is here seen on 22 May 1987 passing the junction and joining the single track to Hatton West Junction from where it will head up to London Victoria. On Wednesday 15 October 2008 the steam locomotive 30777 Sir Lamiel was due to visit Stratford-upon-Avon from London Victoria. To assist with shunting the stock and to bank the returning train out of the station, WCRC 33025 was sent light engine down the North Warwickshire Line, being due to arrive about 30 minutes before the main train. It won't be too long before the mechanical signalling and associated signal boxes along this route are removed so I thought a walk to one of the several footpaths crossing the line between Bearley Junction and Wilmcote might be a good idea so that I could update my photographic collection, not having been along there for years. 33025 appeared on time, following a class 150 DMU from Stourbridge Junction and is here seen seen accelerating away from a long-standing temporary speed restriction across the junction at Bearley. The loose-looking support wire for the bracket signal, appearing above the locomotive, doesn't seem to be performing any useful function! I very rarely bother to go out and photograph charters these days as they hold little interest for me and I dislike the frenetic activity of some other photographers who arrive at the last moment, barge their way into the gallery and then disappear in order to charge off to the next vantage point near the motorway; usually obtaining poor quality rushed shots. However, I have always had a soft spot for class 33 and the combination of a pair of WCRC liveried examples and a sunny morning on Saturday 23 August 2008 saw me heading towards Ashchurch for this shot of 33207 + 33025 on a 1Z33 Crewe to Weymouth railtour. The narrower body of 33207 is easily seen in this view, as is the crew member in the cab of 33025. I don't know the reason for this unless he was operating the ETH controls if those in 33207 were not working correctly. The footbridge at Northway wasn't my first choice of location but my favoured spot was still heavily shadowed at 08.30 so there wasn't a lot of choice without driving further and I wasn't that interested. 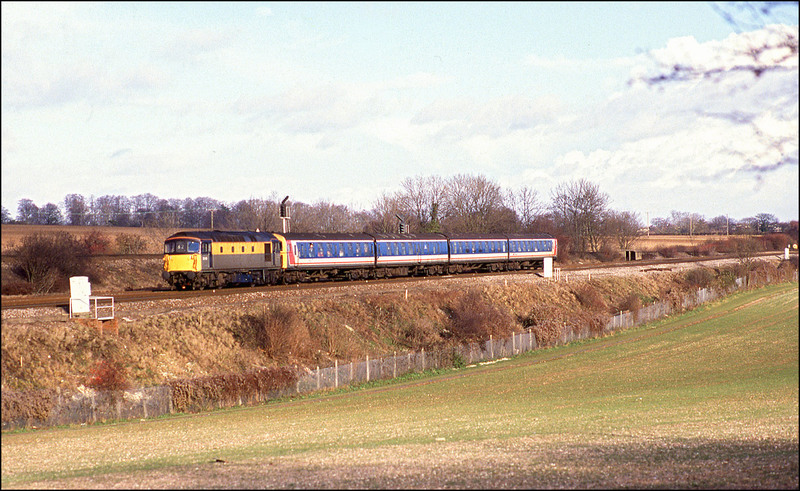 This shot should have been the best colour image of the day as 33114 approached Quainton Road station on the Calvert to Aylesbury line with an SEG tour to Thame and Chinnor on 12 November 1988. However, things don't go to plan and thanks to a malfunctioning cable release attached to my Olympus OM1, this black and white photograph was all I obtained, and I took that too soon meaning that the picture has had to heavily cropped with a resulting loss of quality. 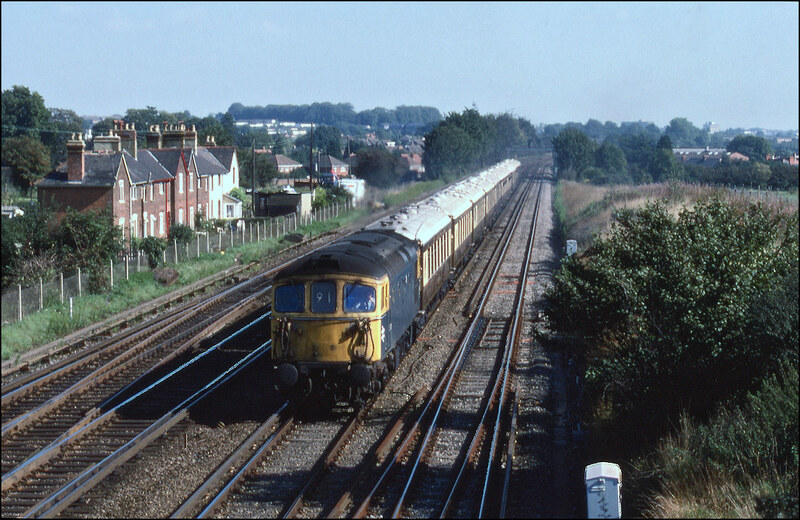 The branch from Princes Risborough to Thame, formerly a through line to Oxford, had been retained to serve the oil terminal. Passenger trains were exceptionally rare and the sight of an 8TC propelled by 33114 was unique and predictably attracted a lot of enthusiast attention. I did take some shots on the Chinnor branch but the light had deteriorated to such an extent by the time the train reached there, that they are not of high enough quality to show here. 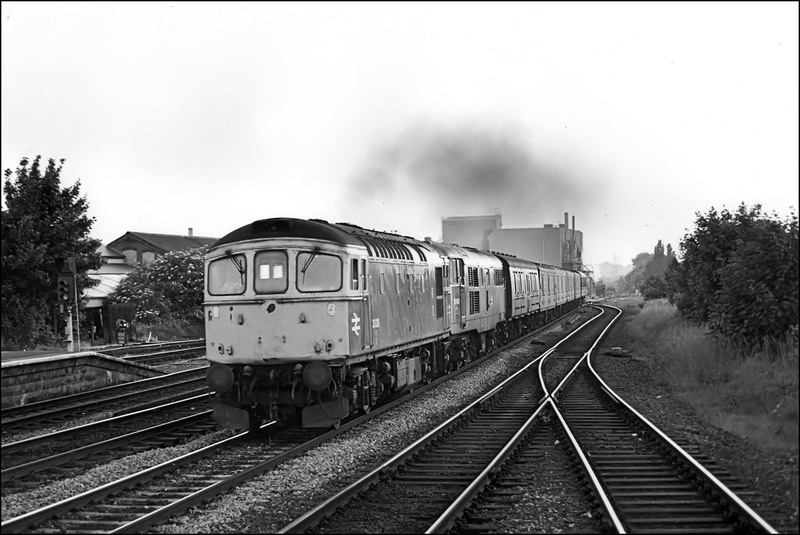 During the evening of Friday 21 October 1988 I received a telephone call saying that there was a Wool to Birmingham (New Street) troop train running via Soilhull the following morning and that the word was that it would be formed of a class 33/1 with TC stock. This meant that previous plans were rapidly laid aside and a location decided upon to show the stock to its best advantage. The next morning found me near Bordesley Junction as the curve from the Snow Hill line would have the desired effect. The train was late and I had almost decided that a route change had occurred and that it had gone via Coventry when the unmistakeable sound of a 33 being opened up came to my ears. 33108 with a 5TCB + 4TC rounded the curve giving an almost unprecedented sight for the area. I bet it gave the spotters at New Street a bit of turn! I had assumed, in the absence of any gen, that the ECS would return via Coventry after going to Soho, Bescot, Aston and Stechford and made my way to Berkswell. Sadly, the stock simply reversed and went back the way it had come , being driven from the TC cab. Now that would have been a different shot at Hatton! 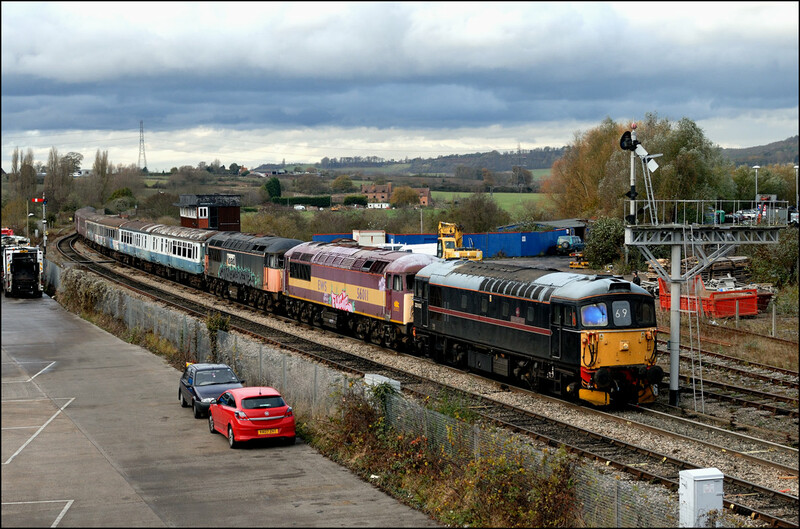 Cotswold Rail's newly painted 33202 was booked to work from Bristol Temple Meads to Brush at Loughborough to collect a refurbished HST power car on Friday 7 September. I am not keen on photographing light engine movements but when I looked at the schedule for 0Z45 there was a 20 minute break at Gloucester and hoped that this would mean that a couple of barriers would be picked up despite the fact that the headcode was not being changed to a class 5. There was a problem with the locomotive just outside Bristol and it took nearly an hour to reach Parkway station. The stop at Gloucester was either missed out or curtailed and some time was made up before my photograph was taken at Stoke Prior. There was more trouble in store for 33202 and it apparently caught fire at Loughborough so the southbound move obviously did not take place. 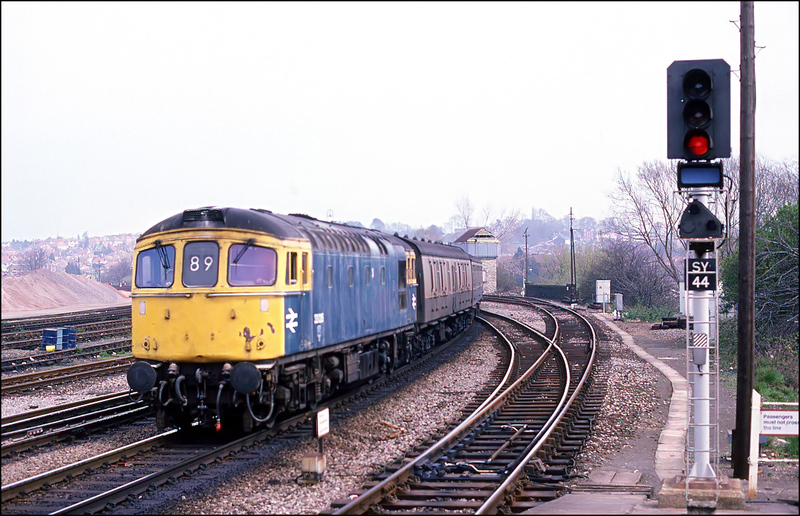 There had never been a class 33/1 at Stratford-upon-Avon, to the best of my knowledge, before Saturday 22 May 1993. 33/0s and 33/2s had been occasional visitors in previous years hauling the VSOE so when it was announced that there was to be a Push Pull Tours excursion from Weymouth to Stratford on that date, my appetite was well and truly whetted. The train, headed by 33109 hauling the blue liveried 8TC stock, arrived bang on time and is here seen in platform 2 after it had shunted from the arrival platform. The weather was absolutely awful and the colour shots I attempted were no more than a waste of film. The background here was in the throes of being changed from a wartime Ministry of Food coldstore into a Safeway superstore. Also visible is the 1933 Stratford East signalbox, which disappeared not long after this picture was taken, control of the station being taken over by Bearley Junction 'box. Here is the somewhat unusual sight of a former Southern Region 8TC set standing in platform 2 at Stratford-upon-Avon, alongside a Thames Turbo class 165 unit. 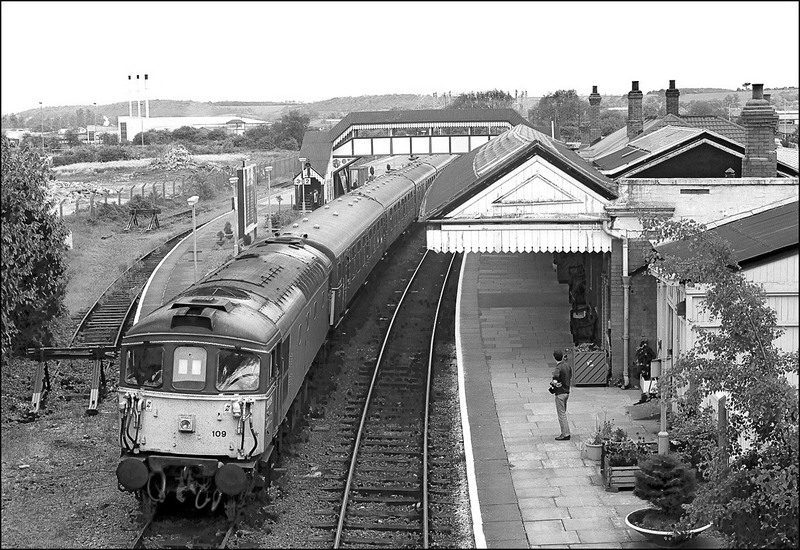 The train, with 33109 providing the power, had arrived at the terminus on 22 May 1993 with an excursion from Weymouth. There was quite a layover at Stratford, which gave the tour participants plenty of time for a wander around the town and to find refreshments. Somewhat unusually, the return of the Weymouth tour was booked to call at Wilmcote, the first station out of Stratford, and the train is here seen approaching the stop being propelled by 33109 to pick up several passengers, one or two of whom had clearly availed themselves of the hospitality in the 2 local pubs. Even considering the dreadful weather, I was surprised to be alone to record this unique and unrepeatable sight. 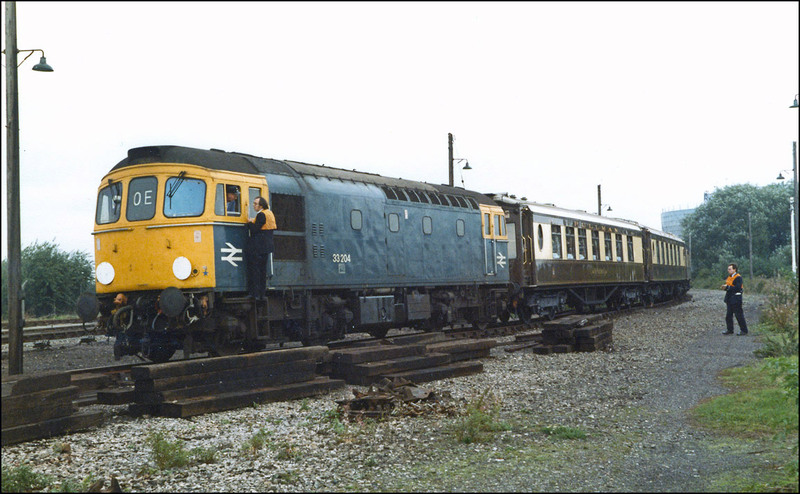 I had often noticed that class 33/1s, when propelling TC stock, made more racket than when hauling it; maybe the electro-pneumatic control equipment was a little less sensitive when operated from the trailer cab. 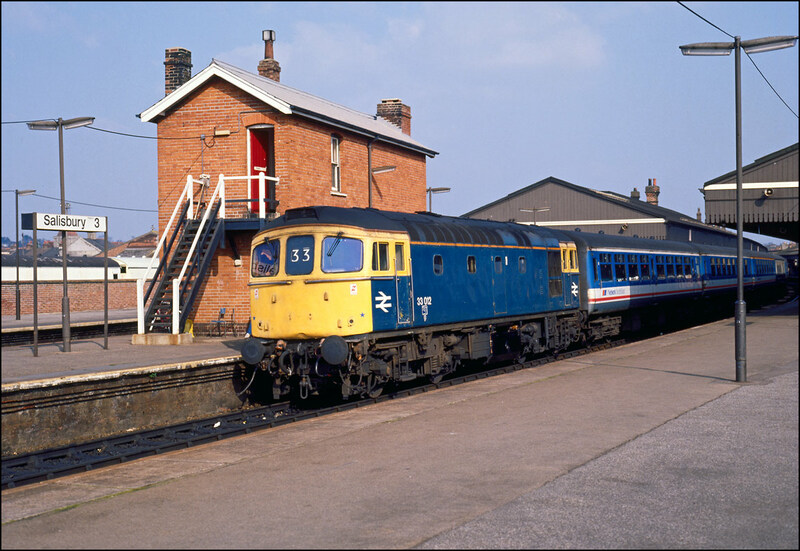 I can well remember the impressive exhaust sound of 33109 as it pulled away from the Wilmcote stop mentioned above with the return leg of a charter from Weymouth to Stratford-upon-Avon, evidenced by the smoke being laid over the atractively restored station on 22 May 1993. Despite visiting Basingstoke 2 or 3 times each month for nearly 4 years I failed to get a decent photograph of a 33 heading north on the Reading line. 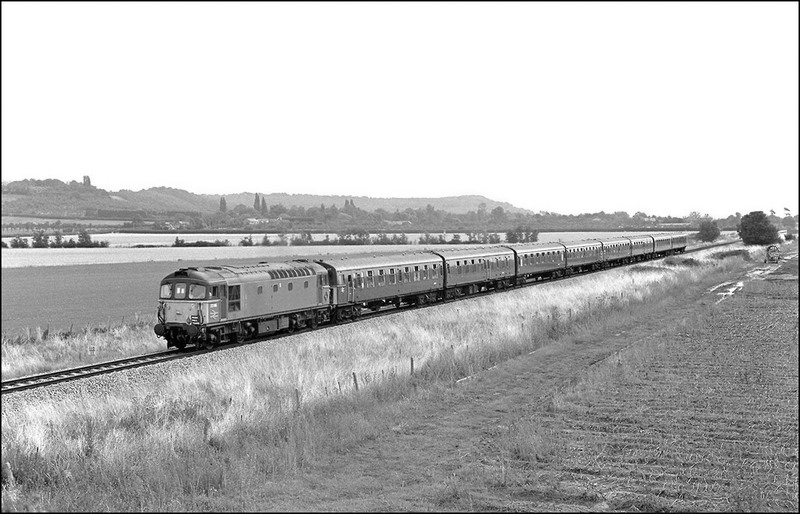 This is my only such shot and shows 33113 with an MOD working from Ludgershall to Didcot on 7 August 1987. The backdrop here has dramatically changed in the intervening 20 years and the DEMU in the branch platform would now be a Thames Turbo. 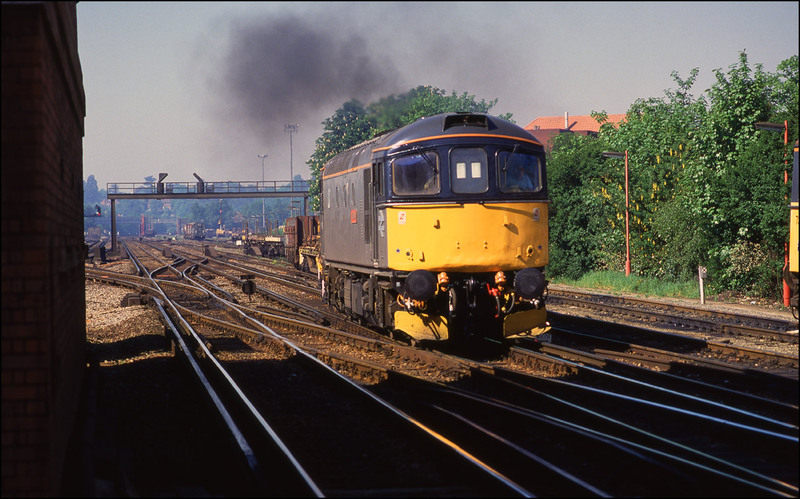 In May 1990 I decided to have a go at photographing some of the trains running from Angerstein Wharf, a branch off the line between Southwark Park Junction in south-east London, and the Crayford Spur, near Dartford in Kent. 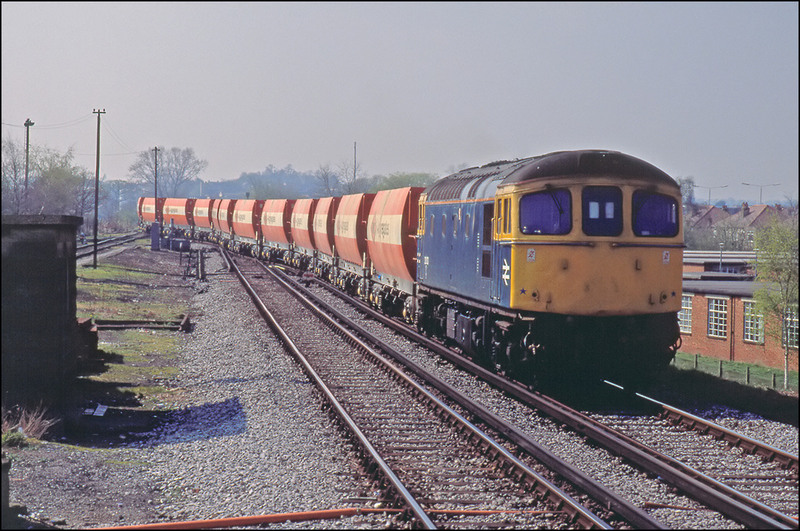 On 2 May, I was travelling in a 4EPB unit from Waterloo East with the intention of getting off at Charlton in order to photograph the Angerstein Wharf to Park Royal aggregate train. It was a hot day and I had the sliding windows of the unit open and shortly after leaving Westcombe Park station I heard the unmistakeable sound of a pair of Cromptons. Looking down the embankment I saw 33058 + 33004 on the branch and grabbed this shot; luckily, I had my cameras ready as the booked time for the freight was not much after my train, and I wanted to be ready when I reached Charlton. Considering that I was on a moving train and that the shot was pretty much into the sun, I think that the outcome wasn't too bad. Charlton station was the next stop where I alighted and made my way onto the footbridge. 33058 + 33004 appeared withing a few minutes and I was able to get this shot - exactly what I wanted - a freight in recognisably urban surroundings. Trains still run from Angerstein Wharf to various locations and I should like to go back to the area soon to get some up-to-date pictures. On 25 May 1990 I had another trip to photograph the Angerstein Whark to Park Royal train and had already decided to try a shot at Belvedere station, a few stops further East than Charlton. I had passed through on the train a couple of times and thought it had some potential for an interesting picture. As was usual on an line with a very intensive passenger service, the aggregate train hauled by 33063 + 33027 was spot on time and is here seen accelerating from a signal check occasioned by the unit on which I was travelling. In the distance, another 4 EPB can just be made out standing in Abbey Wood station, showing what an excellent off-peak service these busy lines had. 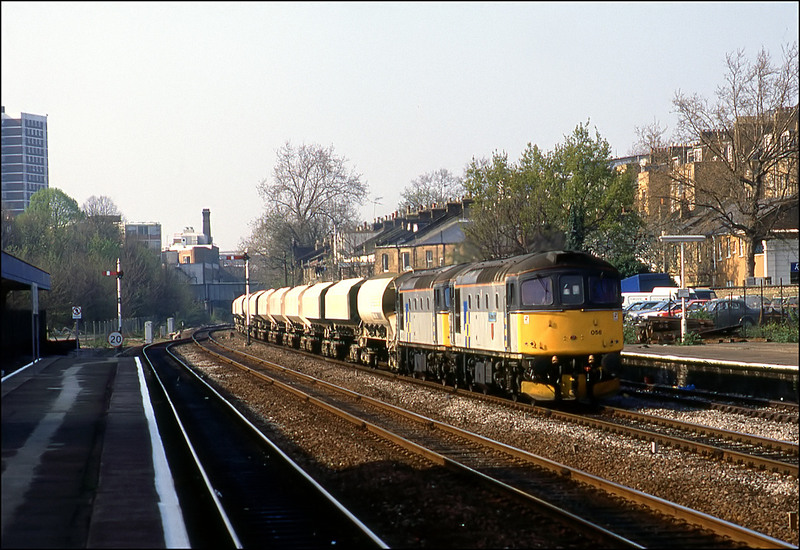 Here is a picture taken at Culvert Road Junction near Clapham on Saturday 11 February 1989. The train is Pathfinder's "Maid of Kent", the 1Z45 05.29 Manchester Piccadilly to Ashford, via Dungeness, hauled by 33106. The train was brought as far as Kensington Olympia by class 47 97561 which, I seem to recall, was a late replacement for an unavailable 45106. This was quite an interesting place to stand for a while, with the lines to Waterloo and Victoria passing over the lines to Lewisham. There is quite a mix of housing visible here, ranging from mobile homes, through high rise flats to the Victorian terraces parallel to the lower level lines. In the days when postal trains ran across the whole network there was a short period for Crompton fans to obtain photographs at Hatton of the Gillingham to Preston vans. It ran during the late evening so was only photographable for a few weeks, and I didn't really take full advantage of the opportunities. Here, though, is 33044 climbing Hatton Bank on 4 August 1987. For some reason, I took the shot far too early and the resulting transparency has had to be heavily cropped which accounts in part for the less than ideal composition. 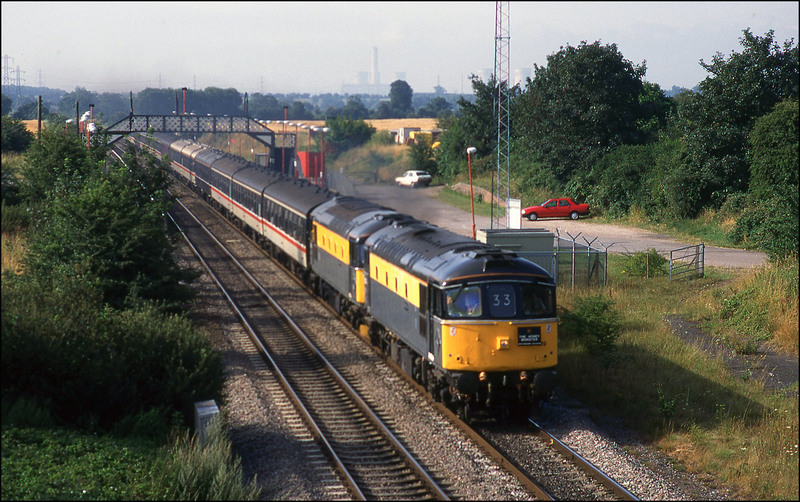 The class 33 worked only as far as Birmingham New Street where its train would have been combined with one from the WCML and taken forward by an AC electric locomotive. 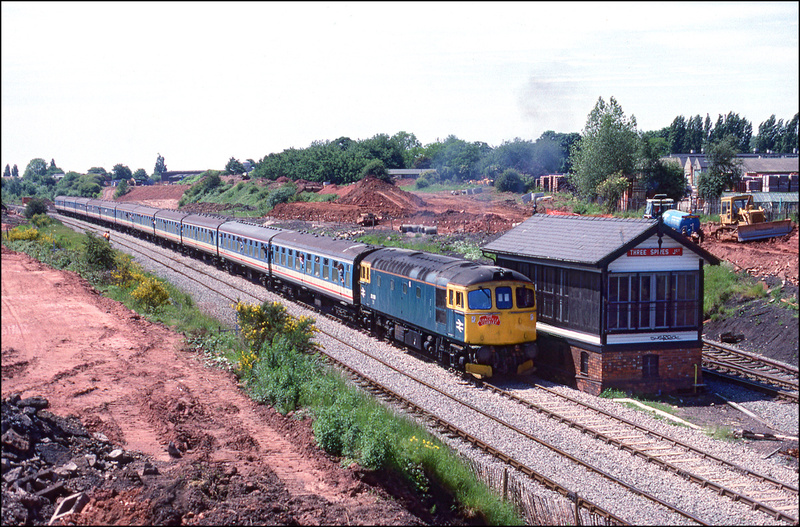 By the following year, this train had been diverted from the Hatton line to run via Coventry. I had another pop at 1M85 the following evening and as the train was late and the sun off the tracks by the bridge, took my shot from a little further up the cutting, which, in retrospect, was a very good move. Here is 33049 narrowly avoiding being obscured by an up MGR hauled by 58036. The light had pretty gone by this time and my notes tell me that I took the shot on Kodachrome 64 at camera settings of 1/125 @ f2.8. This picture is dated 17 May 1988 and was only a few days after the introduction of the class 442 EMUs to the Waterloo to Weymouth route. Here is an unidentified 33/1 hauling an equally unidentified casss 442 to Bournemouth. The unit had not failed but was being delivered to the depot for final acceptance trials. The train is pictured charging along the down fast line through Winchfield station. 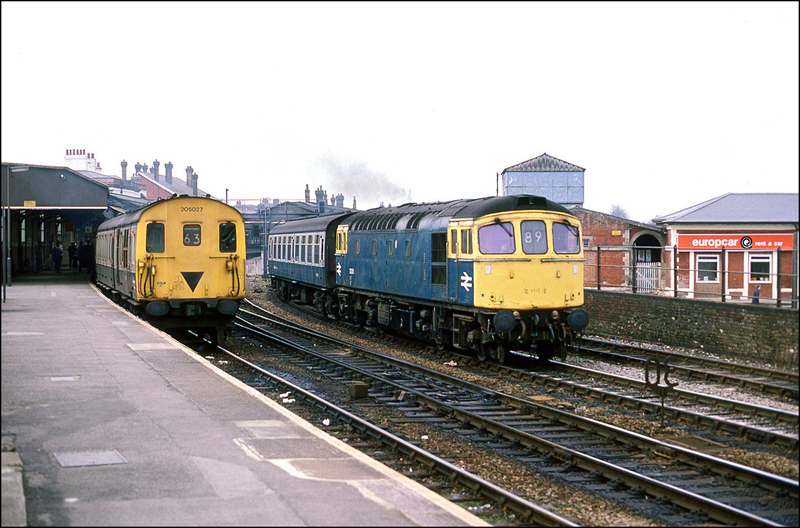 In the days before short multiple-unit trains were considered sufficient for such services as Cardiff to Crewe, a class 33 with 5 or 6 coaches was the regular and comfortable formation. I had a trip to Newport with a friend, courtesy of the famous Persil ticket promotion under which two passengers travelled for the price of one and photographed 33005 leaving the station en-route to Crewe on 11 April 1985. 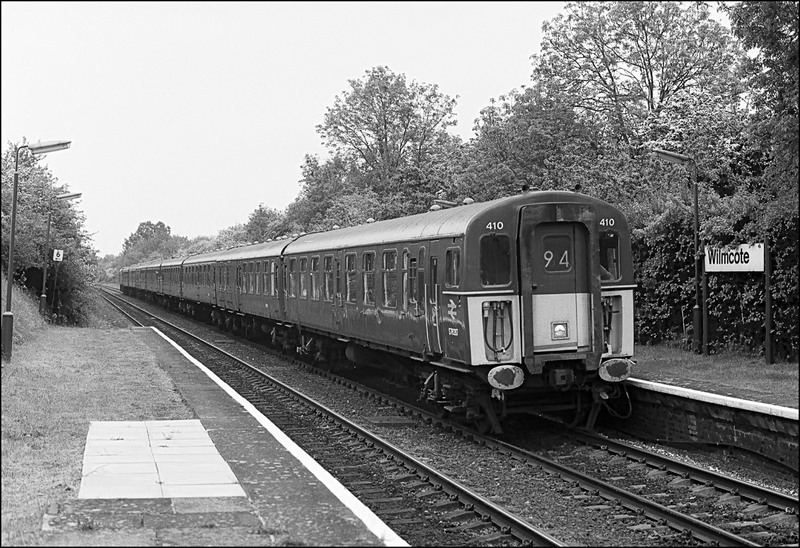 Troop trains were, at one time, quite commonplace on the line between the South-West division of the Southern Region and Birmingham. As these ran via Reading West curve there was no real opportunity for a locomotive change as there would have been had they run into Reading station as the normal inter-regional services did, so there was a better than average chance of a class 33 being allocated. 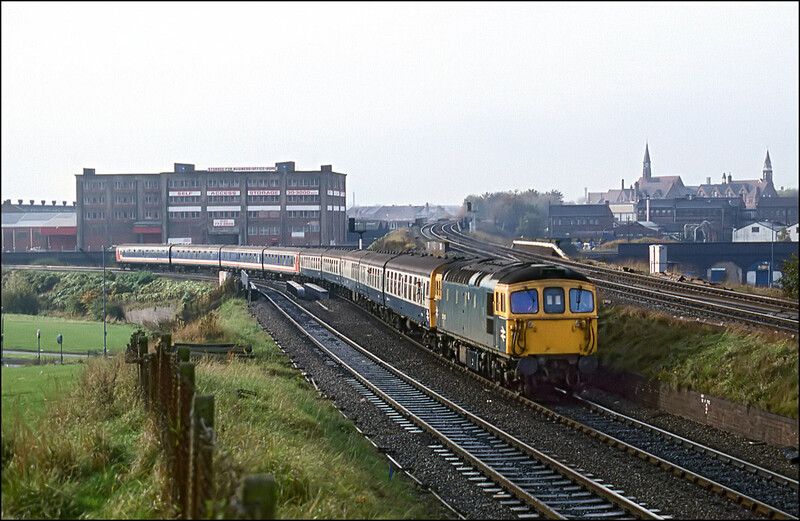 On 25 August 1985 there was a 1Z14 Weymouth to Edinburgh train, which ran as far as Birmingham New Street behind 33043. I suspected that this would run via Coventry rather than Hatton because of the weight of the 12 coaches being over the limit for Hatton Bank for a small engine, although in practice I'm sure that it would have managed the climb without any problem. With this in mind I decided that Leamington Spa station would be the safest bet for a shot and in the event I was proved correct. The Crompton is here seen just opening up as the route indicator was illuminated to show that the road for Coventry had been set. Another Southern visitor to Leamington Spa was 33032. 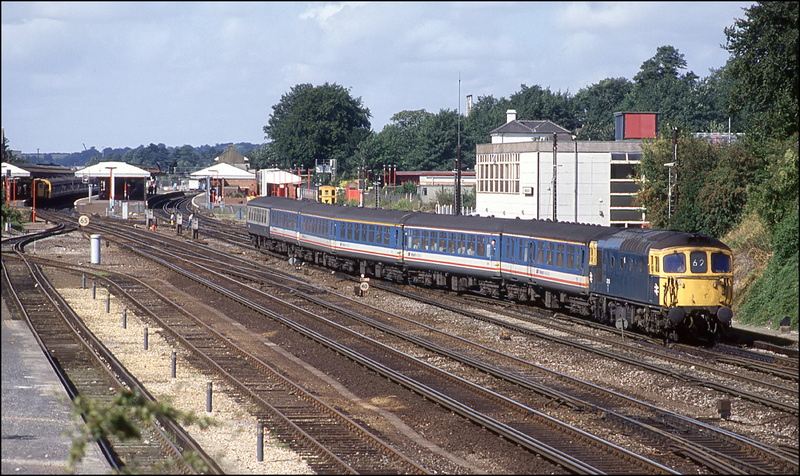 This appeared on 3 August 1985 at the head of a Poole to York relief, and as I have mentioned elsewhere, these trains were always keeping an eye on because they did not generally call at Reading station, which obviated the need to run-round and therefore change locomotives. I didn't know about this one sufficiently far in advance to get to Hatton bank, which on a such a lovely day would have been my first choice of location. The prestigious VSOE has, until recently, visited Stratford-upon-Avon on a regular basis. 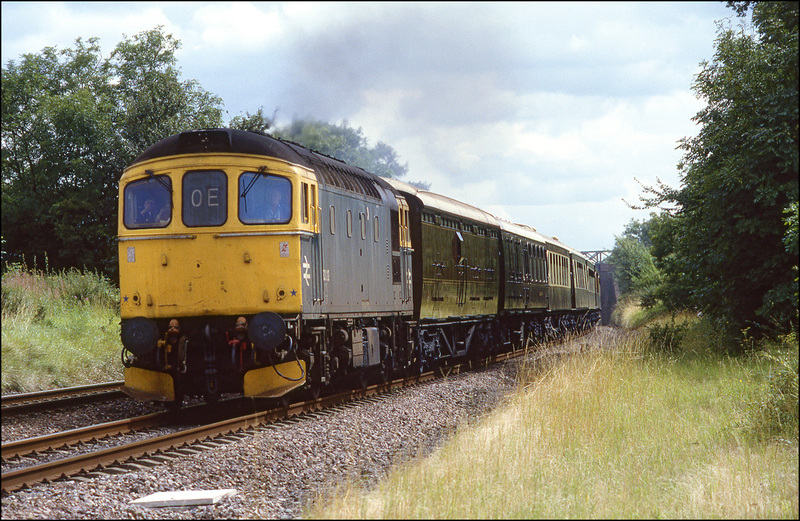 The first trips were exclusively hauled by class 33 locomotives and quite often by a member of the class 33/2 sub class. 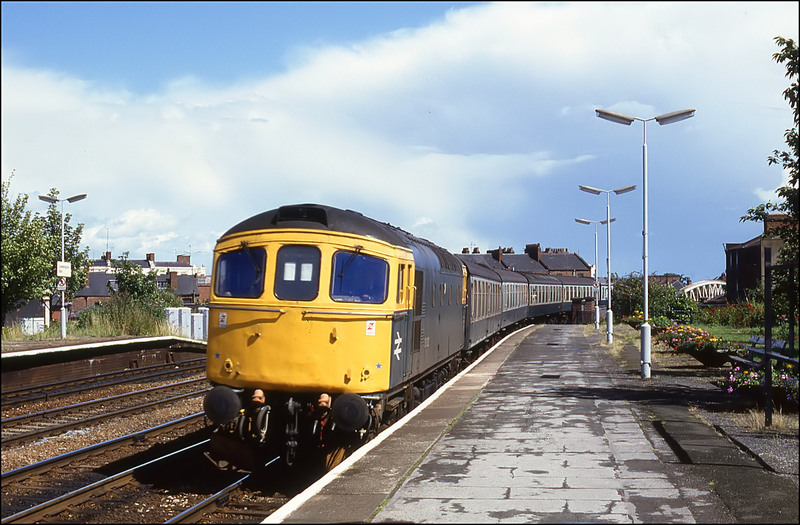 Here is 33212 arriving at the terminus at lunchtime on 22 June 1985. I had made the trip from work to photograph this arrival and although the sun had just about gone off the side of the train, the shot didn't come out too badly. The lower quadrant signal gantry, which incidentally made a good perch for a morning departure on occasions, has long gone. 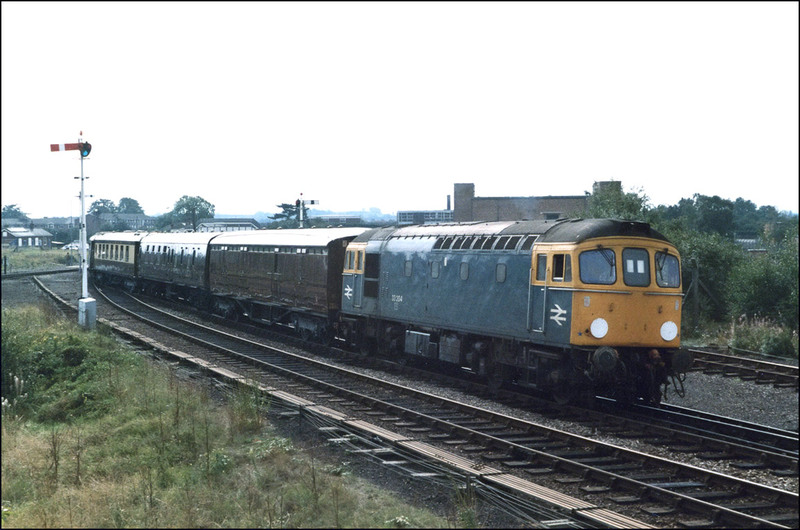 The afternoon of 22 June 1985 remained fine so after a brief afternoon at work, I headed for Wilmcote to photograph 33212 at the summit of the 1/75 climb from Stratford-upon-Avon. The locomotive sounded wonderful on this heavy train and the exhaust shows that some hard work is being done. The spot upon which I am standing is close to the southern end of the former up refuge siding, used to shunt freights out the way of express passenger trains in the days when this line was the GWR's primary route from Wolverhampton to South Wales and the West Country. 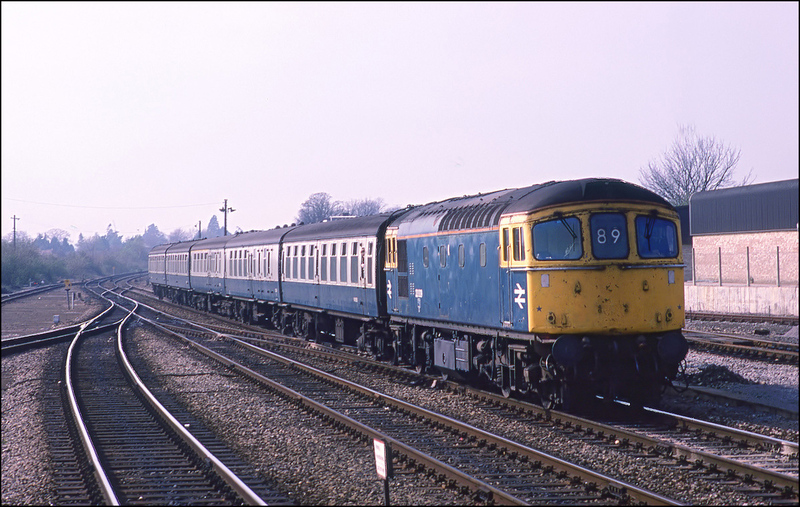 Class 33s have never been commonplace on the Cotswold line (Worcester to Oxford), although they did sometimes work oil trains along there in the 1960s. For a fan both of the line and Cromptons, the chance to bag a baggy was too good to miss. 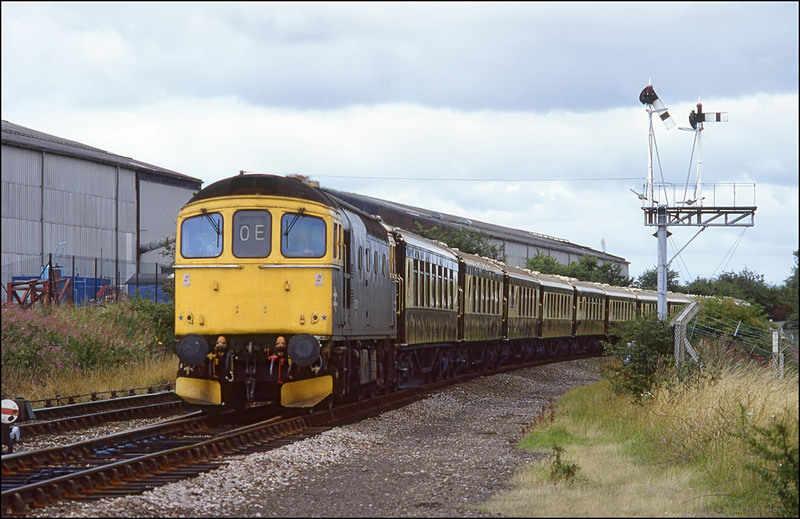 33116 was booked to work an 8TC set from Waterloo to Worcester and Kidderminster on 14 August 1993. 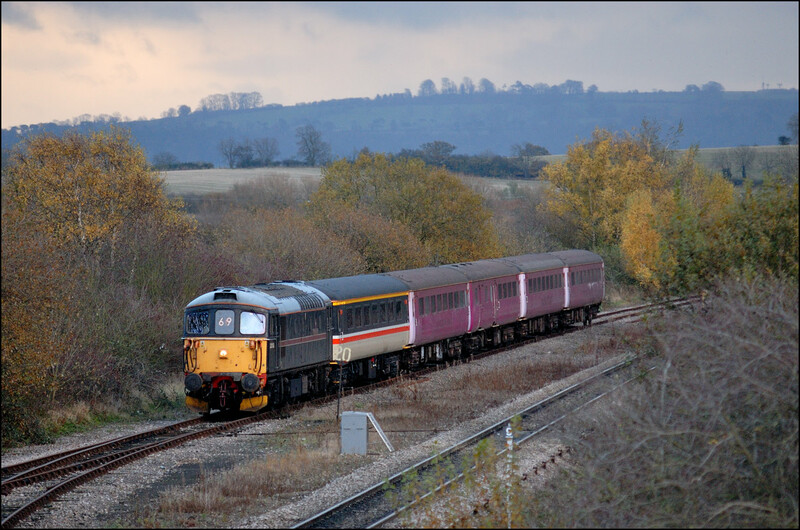 I photographed the outward run near Pershore and chose this spot near Chipping Campden for the return, which the train passed at 19.43. I hope the balloonists were as impressed with the sight of a 33 along this line as I was! 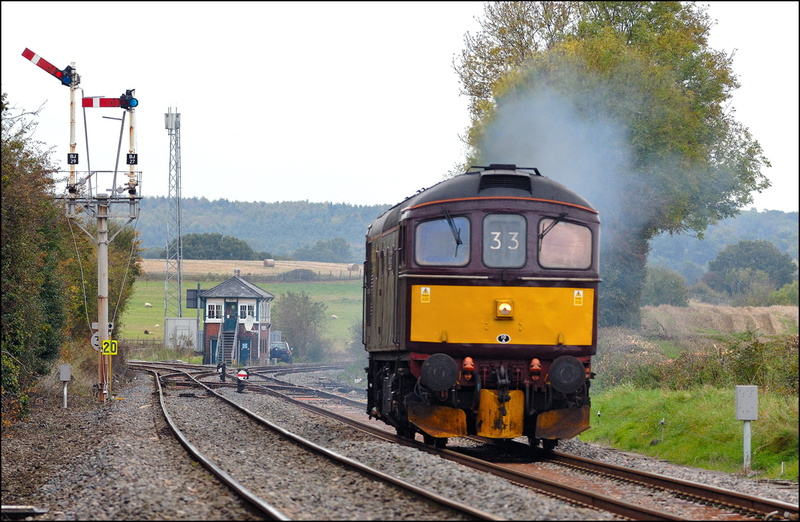 Here is a picture at Lower Moor of the outward working of 33116, the return of which is shown above. It's a shame that the locomotive was in the rather drab grey infrastructure livery, especially on an equally grey day. Having said that, I suppose it's good to record as many colour varieties as possible. 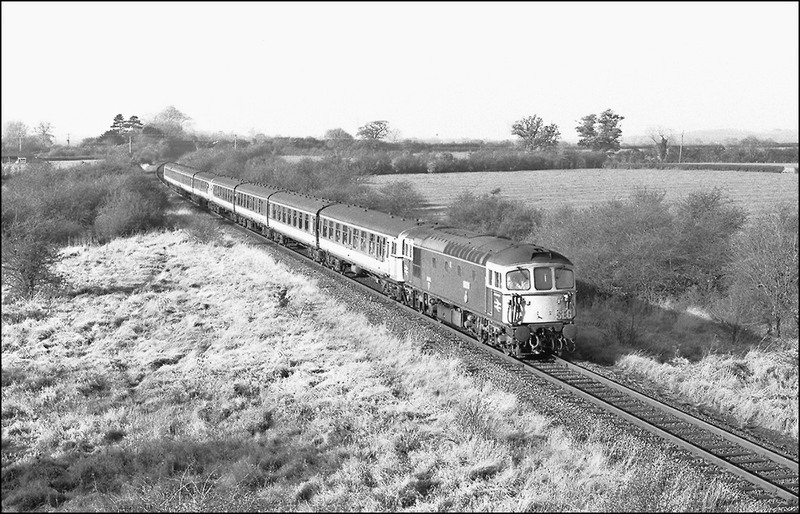 Some 14 years later there is the prospect of regular working of of a Crompton along this stretch of line as Cotswold Rail have bought a former FMR example which will almost certainly appear on a Long Marston run before too long. 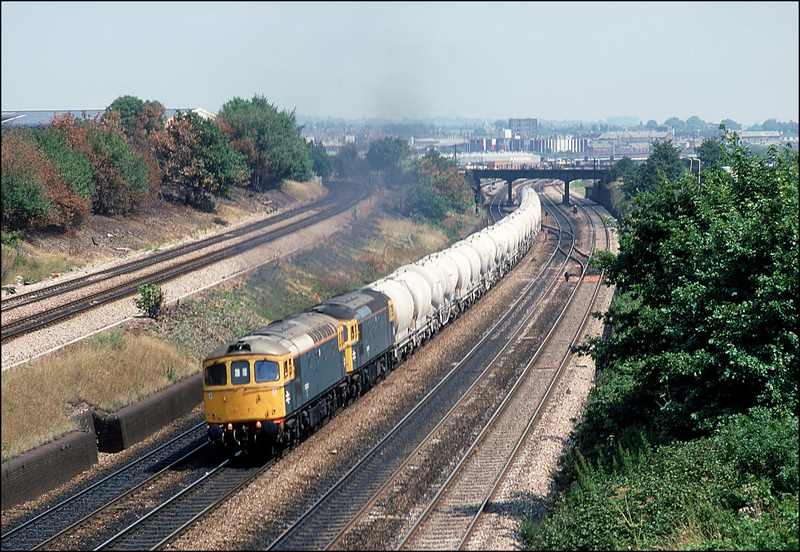 This picture, taken on 28 September 1990, shows Construction Sector liveried 333033+33063 passing between Bexley and Crayford with empties from the tunnel site - the loaded train would have grossed around 2000 tonnes of concrete tunnel lining segments. This peaceful looking scene is deceptive. Immediately behind the camera is the 6 lane A2 trunk road. There is, fortunately, a public footpath with substantial protection from the traffic! The next shot was taken a few minutes on the other side of the A2, which is well-hidden from sight, if not sound by the row of trees. This train is a Purley - Cliffe Brett Marine empty hopper working - the loaded train being used to take excavated material from the tunnel construction site to be used for road building. The pair of blue locos is 33006+33023. After a run in an 8 EPB "slammer" from Crayford I decided to get off the train at Lewisham in an attempt to photograph the train from Battersea to Angerstein Wharf (7O78). After a wait of about an hour 33042+33207 rolled down the bank towards the station. This platform-end shot always appealed to me although if an up train appeared there wasn't much of a shot to be had. One or two other pictures from this location will appear in the "Electrics" section. 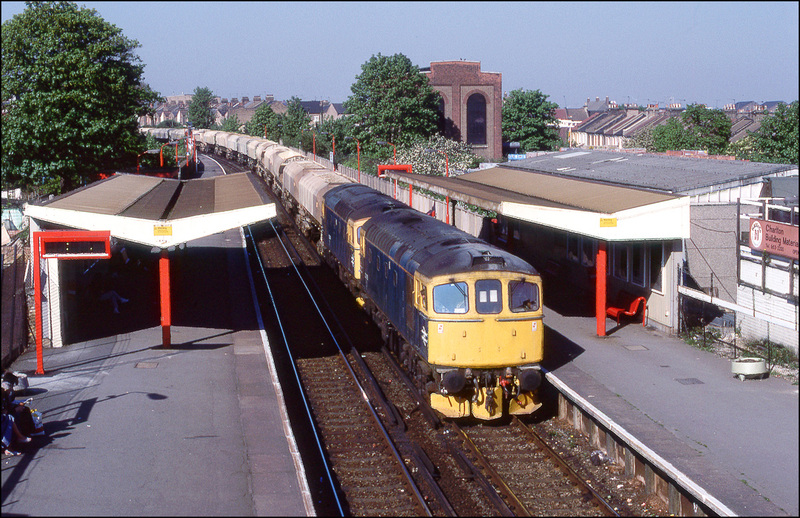 The next shot was taken on 26 October 1990 at Gravesend station and I make no apology for including another station shot in this collection. I prefer to have something in the image to make the location recognisable rather than just taking a train in a bland piece of open countryside. This rule clearly will be broken in other sections of this site! The train was, I think, a load of aggregate from Grain to Sevington via Dartford and Lee Spur, although my notes, as usual, are bit vague. What I do know though, is that I had just been soaked by a very heavy shower, evidenced by the impressively black sky and the puddles on the platform. Luckily, the sun appeared just as the signal cleared for the up through road and the driver opened up as the locos, 33051+33058, cleared the points to give a nice smoke effect. 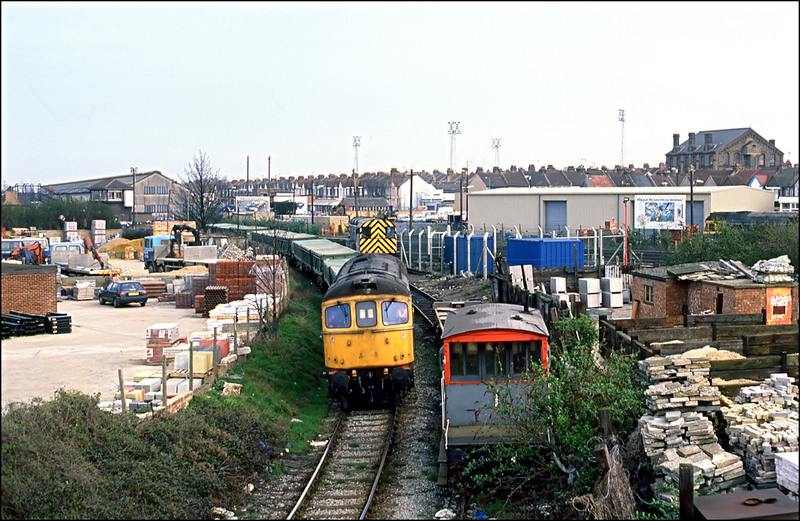 One of my favourite locations for photographing Cromptons in 1990 was Lee station, just around the corner from Hither Green. Empty aggregate and tunnel segment wagon trains had to traverse the very tight curve on Lee Spur Junction onto the Sidcup line and were therefore on full power once the end wagon had cleared the points. This gave some good audio entertainment and plenty of black smoke. 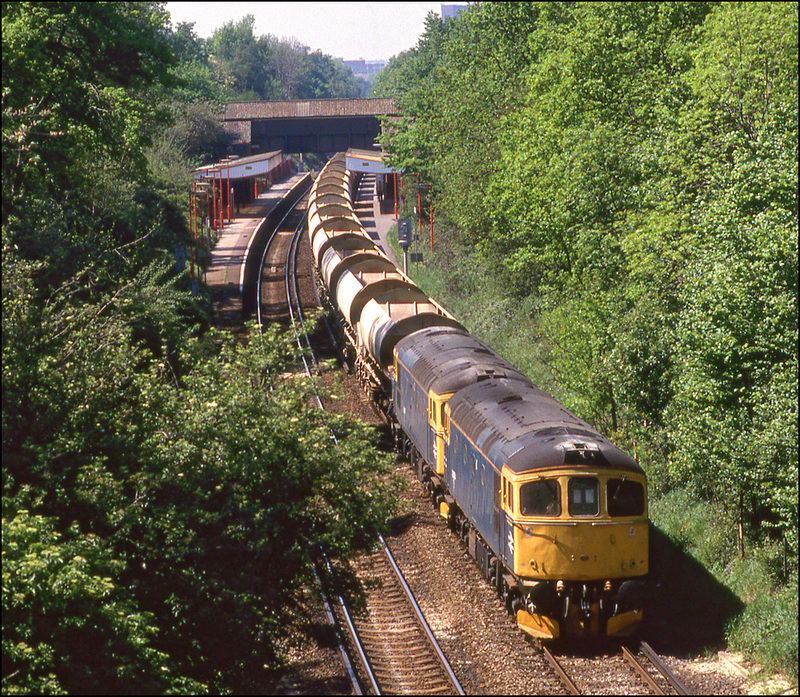 This picture shows 33023+33006 clagging east with 6C66 10.02 Sevington to Cliffe Brent Marine empties on 25 May 1990. At this time, many of the statiions on this line had received the NSE treatment including red lamp posts, but Lee still had the old concrete standards which added to the atmosphere. 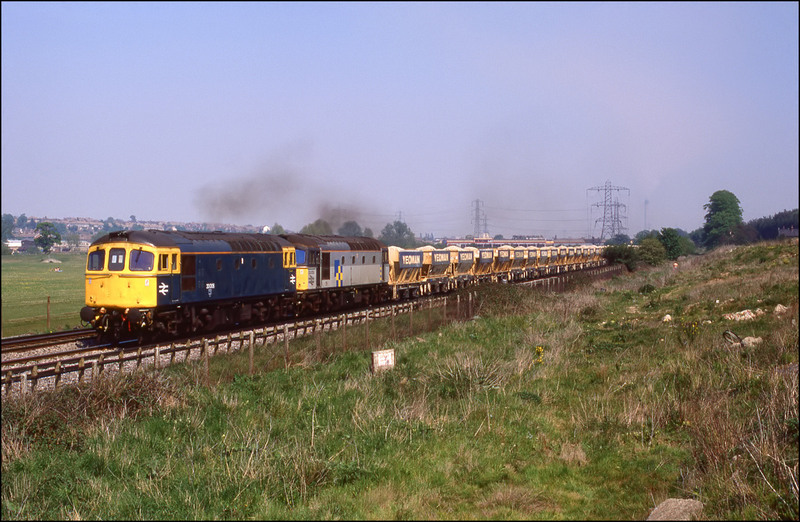 Further east on the Sidcup Loop is Albany Park which 33004+33058 are seen passing with 6C66 10.02 Sevington to Cliffe Brent Marine in May 1990. This train is the returning empties of a service taking sea-dredged aggregate from the Thames Estuary to the Channel Tunnel Construction site. This location was "touch and go" for a clear shot in 1990 and I suspect that the view from this high bridge may these days be totally obscured by foliage. Class 60s never really took off on these aggregate trains and 33s held on pretty much to the end of the work on the tunnel. This is the view looking east from the station at Albany Park. 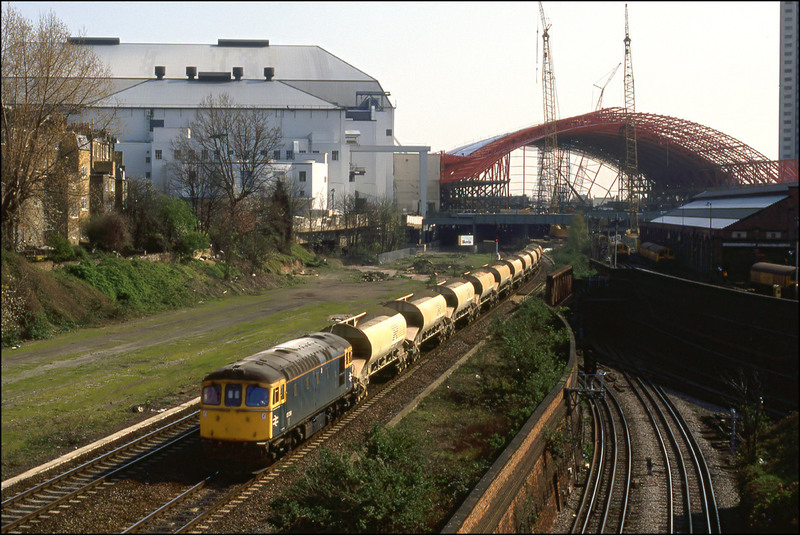 It shows 33058 passing by in September 1990 with the morning Angerstein Wharf to Paddington New Yard, another train of sea-dredged material from the Thames Estuary. I do not often take platform-side shots but thought the composition of this scene to be quite strong and worth a frame even if it didn't come off. In the event I was pleased with the result, showing as it does, the power of the locomotive. 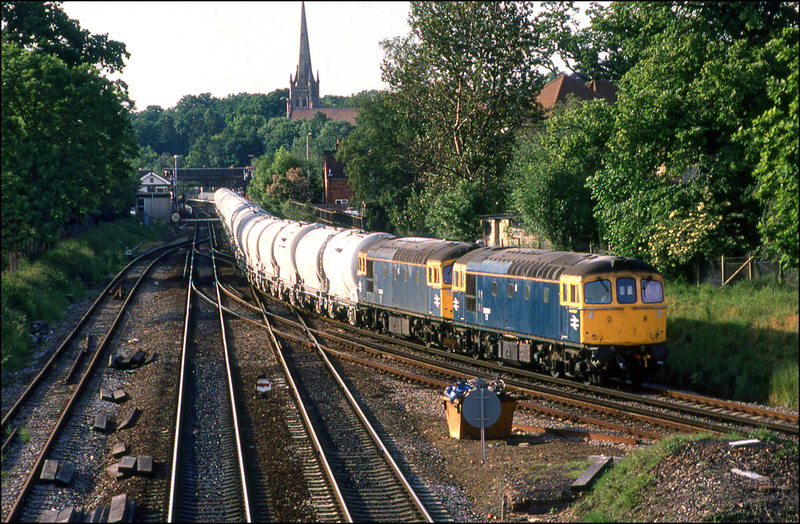 Wokingham in Berkshire did not see many freight trains in 1990, but one eminently photographable one, in the late Spring and Summer at least, was 6O60, the 17.48 Theale to Northfleet cement empties. This was a solid class 33 turn at this time although it did go over to class 60 haulage for a while before it's complete withdrawal. This image shows 33009+33029 joining the Clapham Junction line at 18.22 on 25 May 1990. As part of the major work to renovate Chatham Dockyard, many tonnes of seriously contaminated spoil had to be removed from the site. The job to remove the spoil was entrusted to rail, egress from the branch being by the short and steeply graded Dockyard branch. 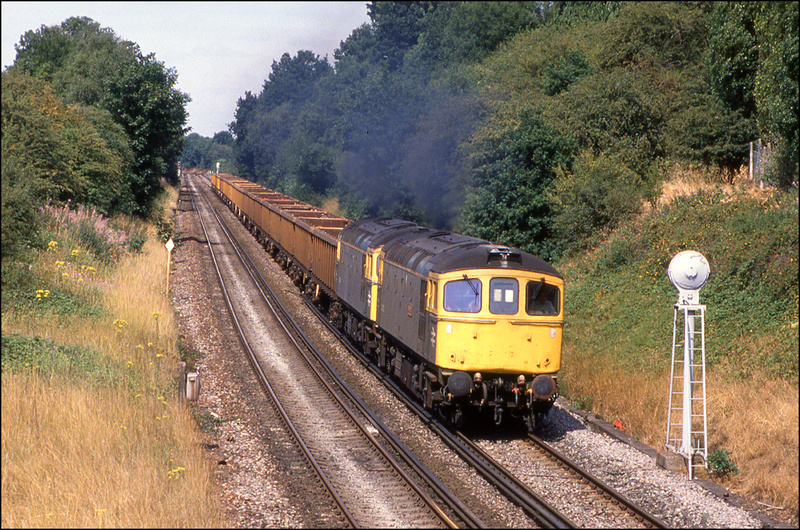 The majority of the workings were carried out by class 33s which, given the gradient of the branch and the weight of the train, were absolutely thrashed as they worked up the branch to the exchange sidings to the east of Gillingham station. 33029 is seen here on 28 March 1991 running the empty wagons towards the dockyard along this very tight little branch. Gillingam siganbox can be seen in the left background. 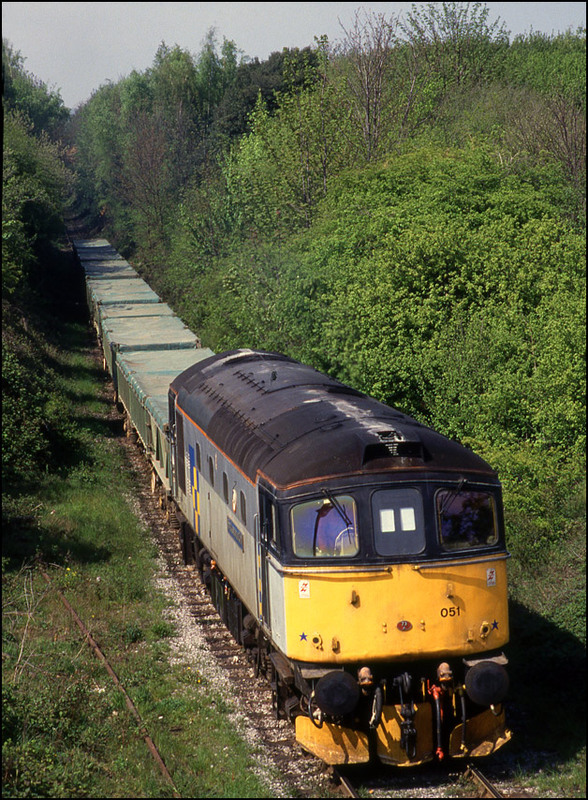 On 3 May 1991, 33051 hit a patch of sun as it stormed up the Chatham Dockyard branch with another train of contaminated apoil. A still photograph gives no impression of the effort being expended by the locomotive with its heavy train on the steep gradient. As the train passed through the overhanging canopy of trees in the background, the exhaust could be seen blasting the branches around - another missed video opportunity. 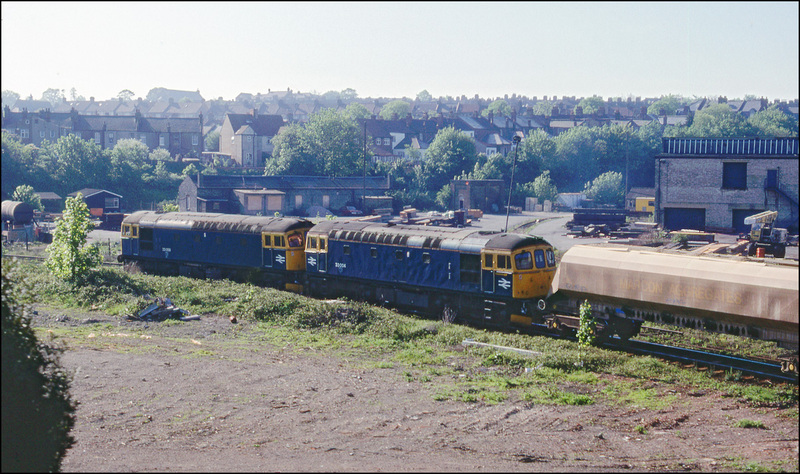 Three trainsloads of spoil from the worksite were joined together in the yard at Gillingham and were taken by a construction sector class 56 to Forders Sidings for disposal. Although most of the trains were worked by 33s the odd 56 did make it down the branch and a shot of this appears in the appropriate section of this site. 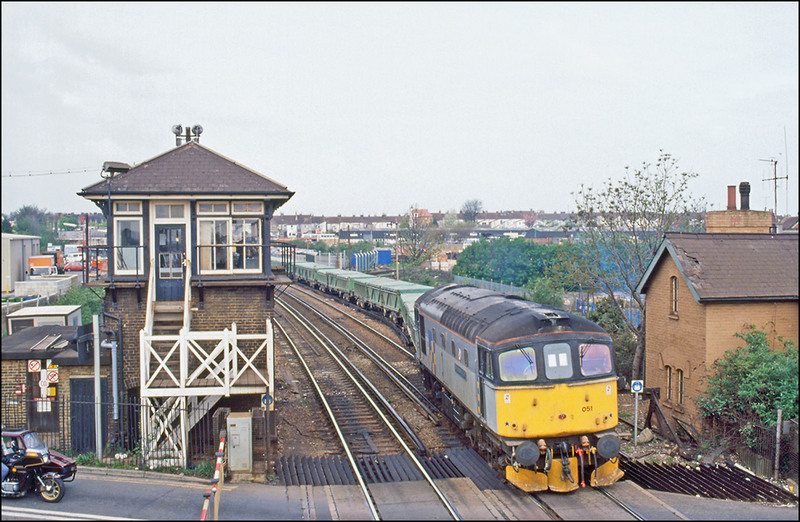 Once the trains of spoil had left the Chatham Dockyard branch they had to run forward past Gillingham signalbox in order to the clear the pointwok before being able to reverse back into the yard where the main line train was made up. Here, 33051 is seen setting back into Gillingham yard. I wonder if the regular passage of these trains had anything to do the state of the roof of the property adjacent to the crossing? 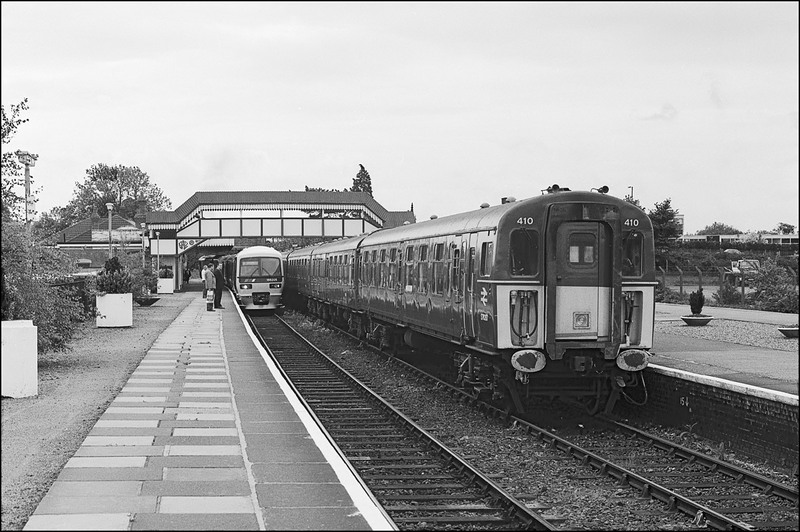 June 1985 saw the main line through Crewe completely closed while the entire station area's layout was remodelled. There obviously was major disruption and Stafford become the terminus for North Wales trains. Here, 33013 is seen waiting at platform 6 with a Stafford to Bangor service. 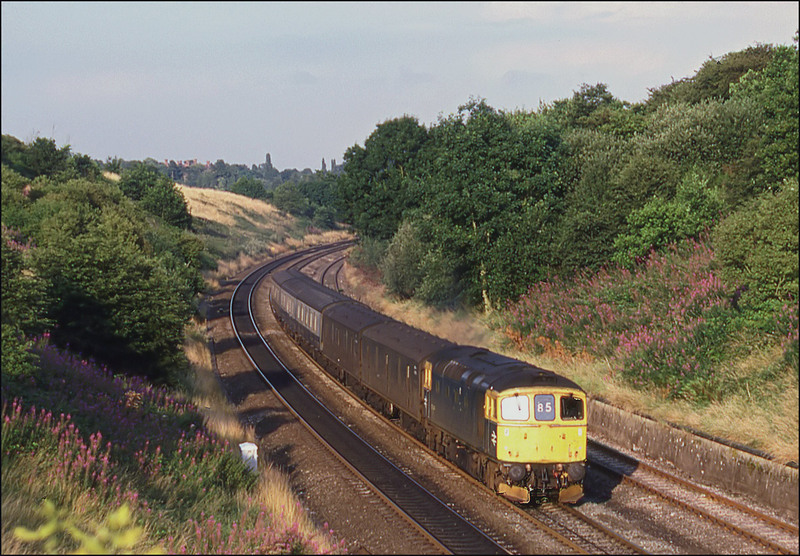 33s have never been exactly commonplace in Staffordshire hence the inclusion of this image. 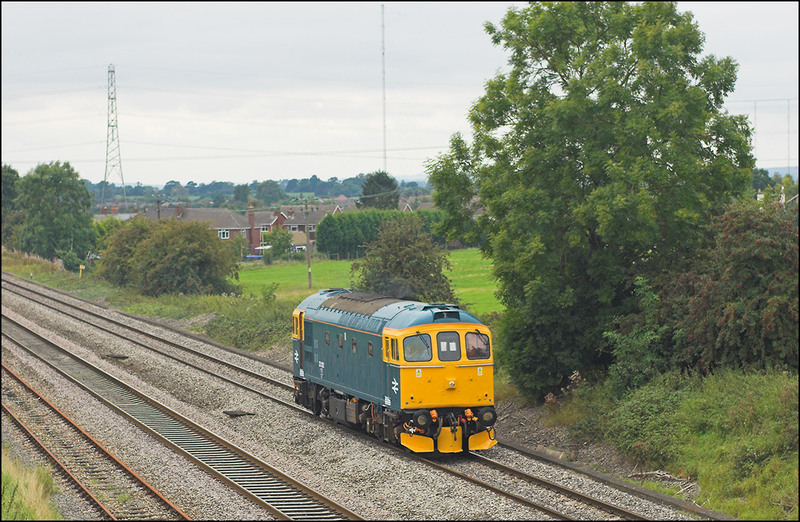 Towards the end of their working life, class 33 became popular for railtour work and the next pictures show some of the workings around the Midlands. First, here are 33008+33026 on a 1Z33 Bristol to Carlisle charter crawling through Droitwich station before heading to Birmingham, Wolverhampton, Shrewsbury, Crewe and Carlisle on Sunday 30 July 1995 at 10.00 exactly. I seem to recall that 33035 was originally diagrammed for this tour but the loco suffered a fire a few days earlier. My original plan was to chase the train to somewhere on the Wellington line but it was a blisteringly hot day and the car I then drove had no climate control, so I didn't bother. 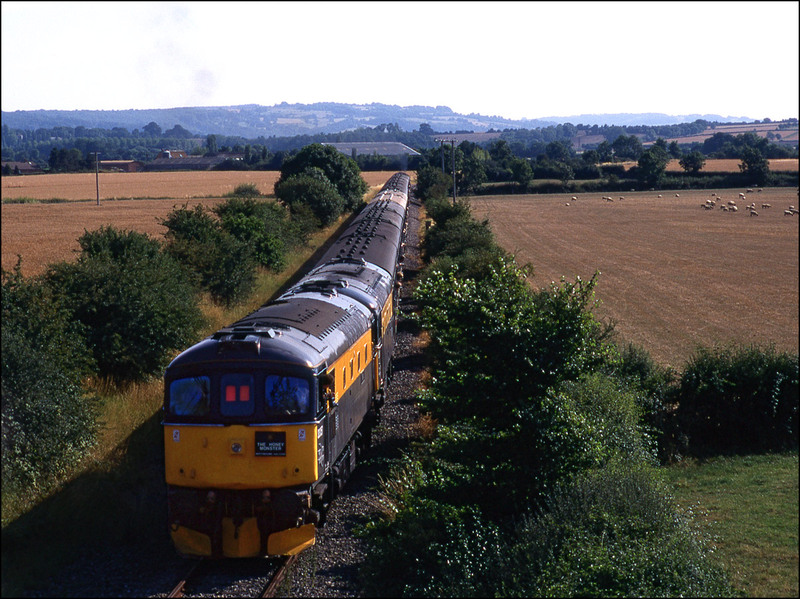 Next, we come to "The Honey Monster" a tour run on 29 July 1995 and which included runs both over the Fenny Compton to Kineton MOD line and the branch from Honeybourne to Long Marston. These locations were used for the storage of spare and withdrawn stock so were an attractive proposition for the enthusiast. The first shot shows 33019+33057 heading north through Radley station shortly after 8am. My non-climate controlled Ford Sapphire, long since sold, is visible in the car park! After leaving the main line at Fenny Compton the tour joined the MOD's line to Kineton and is seen here on the relatively new alignment made necessary by the building of the M40 extension. This line was, of course, part of the Stratford-upon-Avon & Midland Junction Railway. 47348 had been added to the rear of the train at Didcot and remained as assisting loco for the rest of the day. The height of the sun made for some rather harsh lighting so typical at this time of the year. 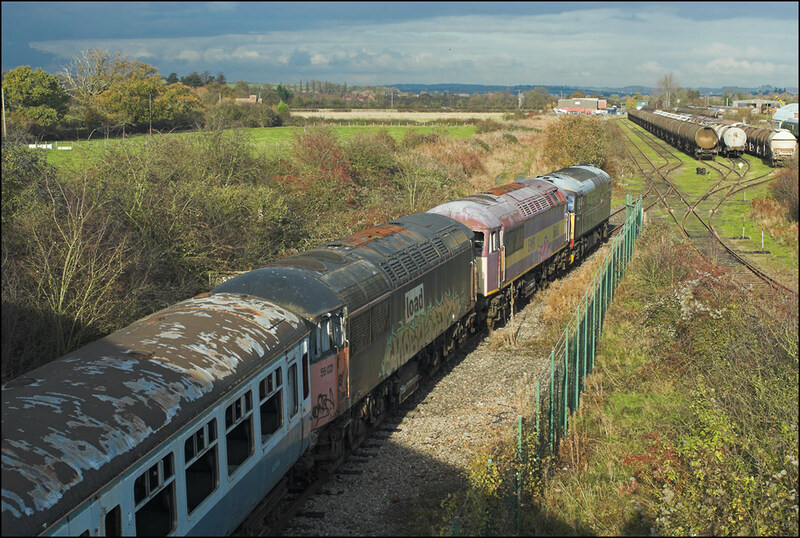 The last shot of this train to appear here shows the rear of the train departing from Long Marston on the rarely - used branch to Honeybourne from where it headed south along the Cotswold line. The 47 was leading at this point and its exhaust can clearly be seen at the front of the train. This picture had to be heavily cropped to remove the elbow of a fellow enthusiast from the left-hand side of the frame, such was the crush of bodies on this bridge. 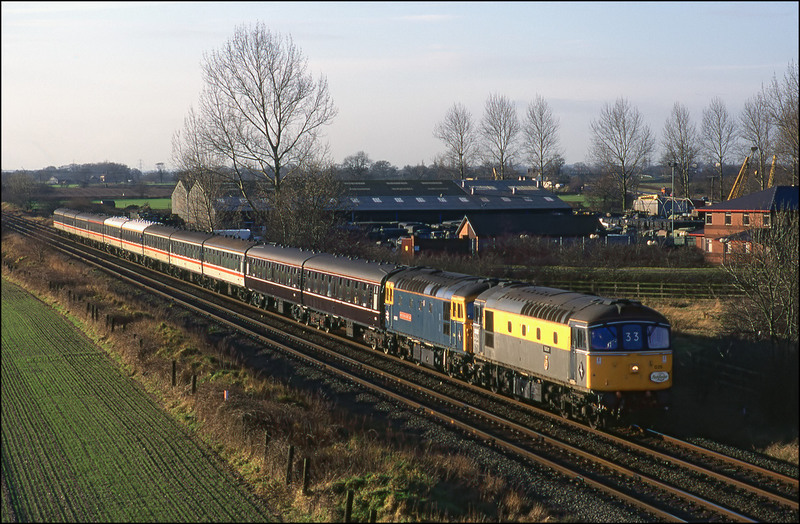 A pair of Cromptons covered some rare track for the class on 28 January 1995 when 330025+33116 ran over the Lichfield to Wychnor Junction freight line. It was not easy to get a shot at this location as few trains used the up line, other than on occasions when Cross Country services were diverted due to engineering work between Wychnor and Birmingham. The train was 1Z27 Swindon to Liverpool Lime Street organised by Pathfinder Tours and given the name "The Gladstone Bag". 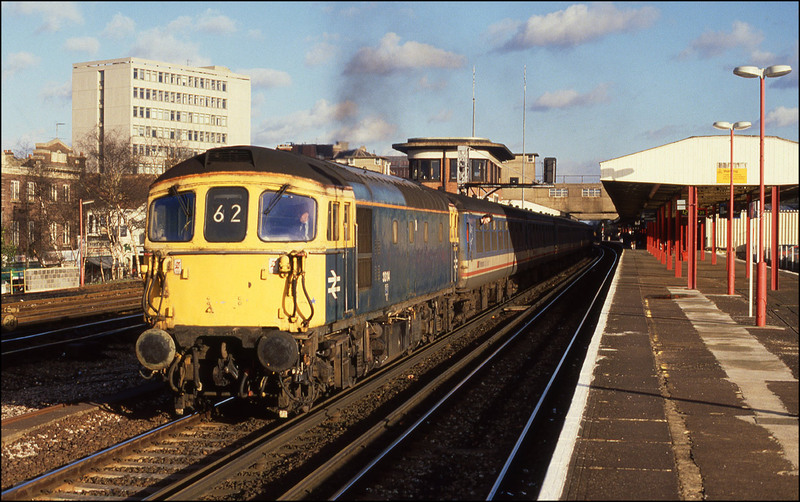 47777 took the train from Swindon to Bristol Temple Meads from where the Cromptons took over. More unusual track for a 33 was the Coventry to Nuneaton line. 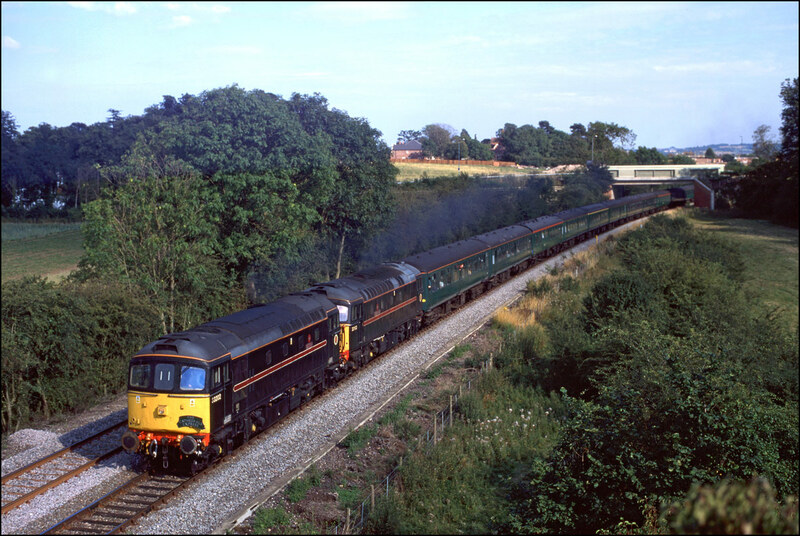 It was visited by 33058 on 11 June 1989 when it hauled a railtour from Waterloo to the Coalville Open Day. The tour was diagrammed for a pair of 33s but one failed before departure. In those days mobile phones were the size of a suitcase and cost about as much as a small car so no "gen" was available once away from home. 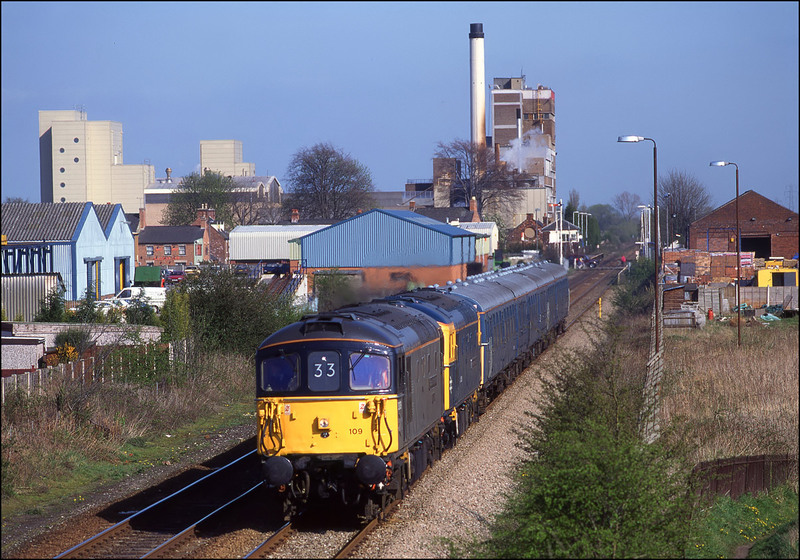 This meant a long wait in the sun at 3 Spires Junction, Coventry where much road construction work was in evidence. 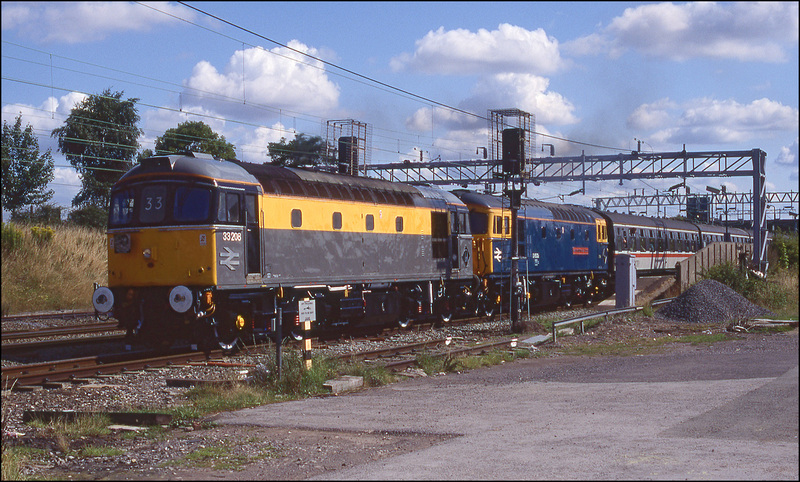 Sunday 21 August 1994 was the date of a major open day at Crewe. 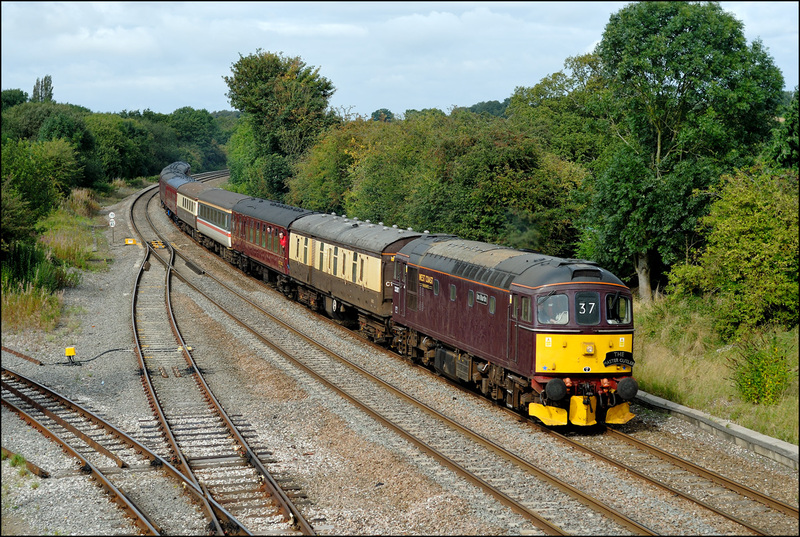 Hertfordshire Railtours ran a special train to the event, 1Z27 "The Cheshire Cat" which utilised 33203+33116. I decided to photograph at Tamworth Low-Level expecting it to be routed on the down fast line. In the event, Pathfinder's train to the open day overtook 1Z27 at Tamworth which had to be looped into the platform line. The full story is in my Class 37 section. The Cromptons are seen leaving the station - not the shot I really wanted but this was all that was available. 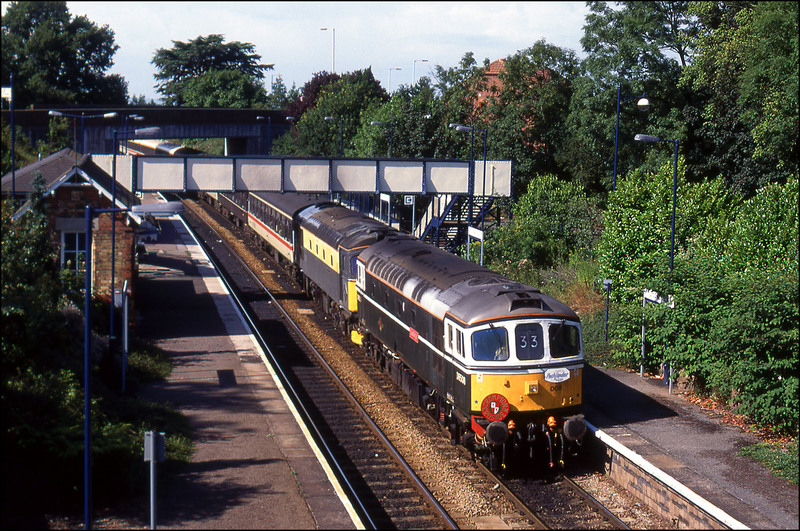 The outward working of the train seen above from Woking to London is seen here passing Staines on 27 September 1990 behind 33009. 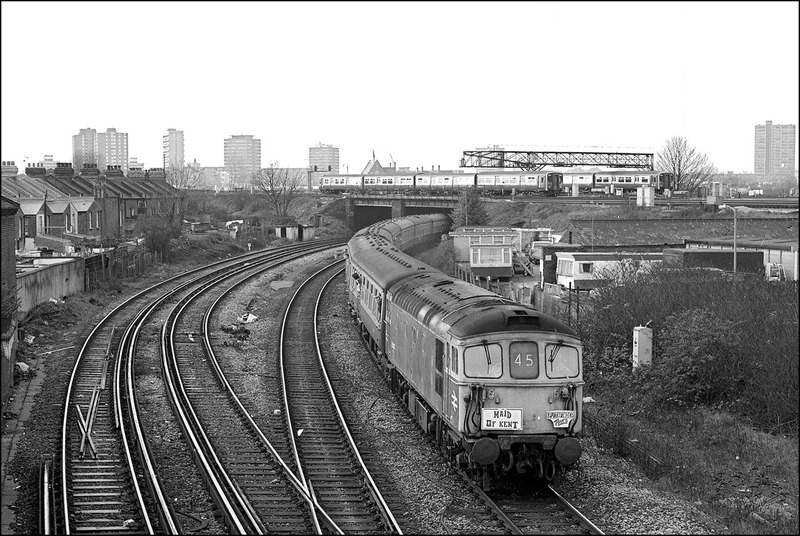 There were sometimes 2 similar trains in the morning along here, together with a Southampton to Ripple Lane freightliner. Class 33 locomotives were still working on the Woking trips in 1990 as witnessed by 33008, now in plain grey, leaving Woking Yard on the morning of 4 May. This train was heading for Willesden and returned in the middle of the afternoon. 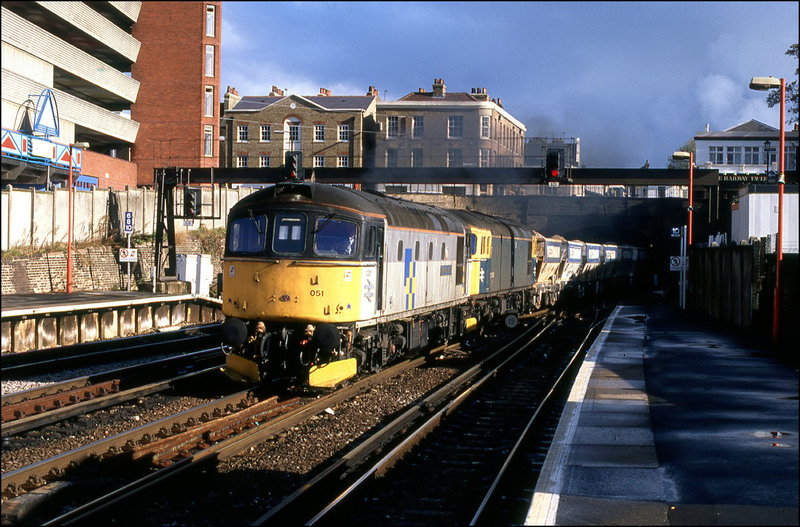 Moving into London we come to Kensington Olympia on the afternoon of 30 March 1990 and witness 33056+33042 passing on a Park Royal to Angerstein Wharf train which earlier had conveyed sea-dredged aggregate to the terminal. At this time the platform by the train was not in use and Inter-City passenger trains had to cross over and use the platform upon which I am standing. The semaphore signals have long since disappeared and 3rd rail electrification is now in place. Just down the road from Kensington Olympia is the Lillie Bridge depot of LUL. 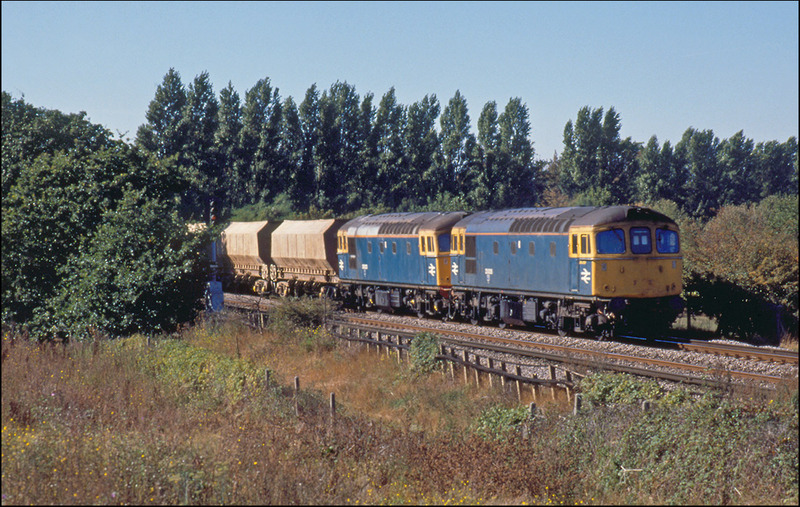 Various battery locomotives can be seen in the deopt as 33058 passes on the BR line with the daily Angerstein Wharf to Padington New Yard aggregate train on 30 July 1990. The extension to the Earls Court building can be seen in progress at the back of the train. 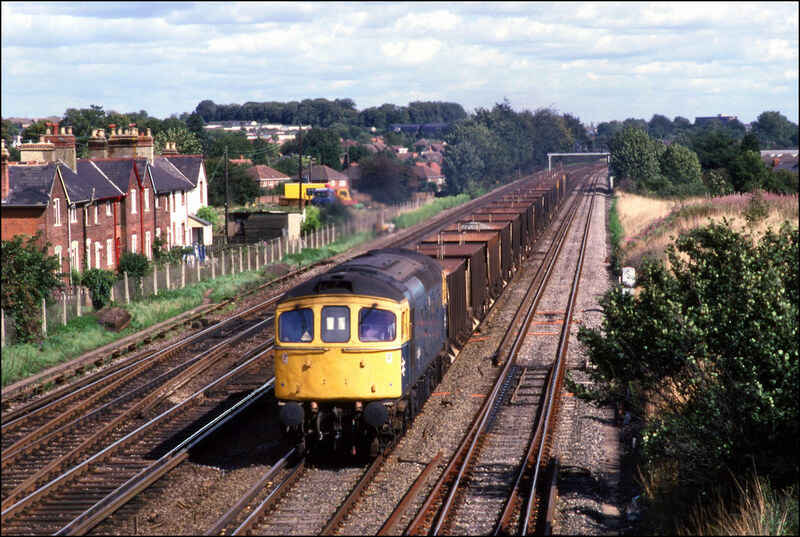 The Chessington Branch by this time had only 1 freight working, the Newhaven to Tolworth gravel train. The coal trains to Chessington CCD had ceased by this time. 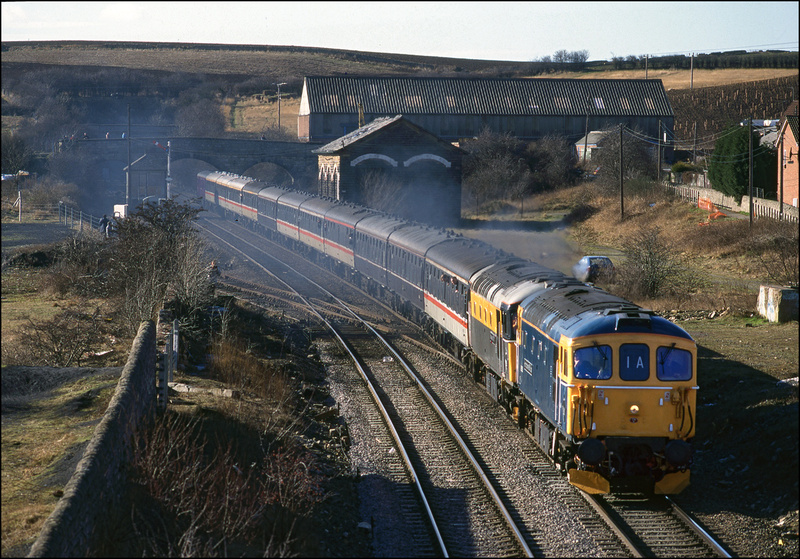 The return empties of the Newhaven train were booked to leave the yard at 13.04 and 33020 is seen here precisely on time on 30 March 1990 crossing onto the up line towards London. 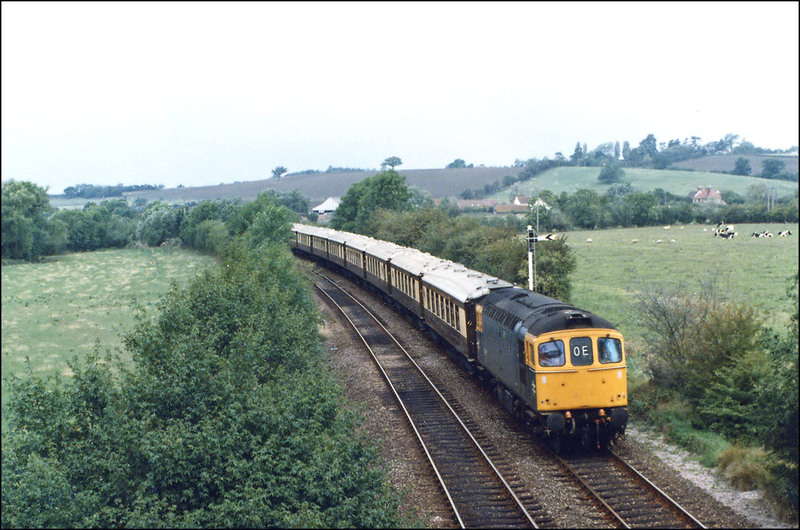 In 1989 there was a daily ballast working from Hoo Junction to Meldon Quarry in Devon. 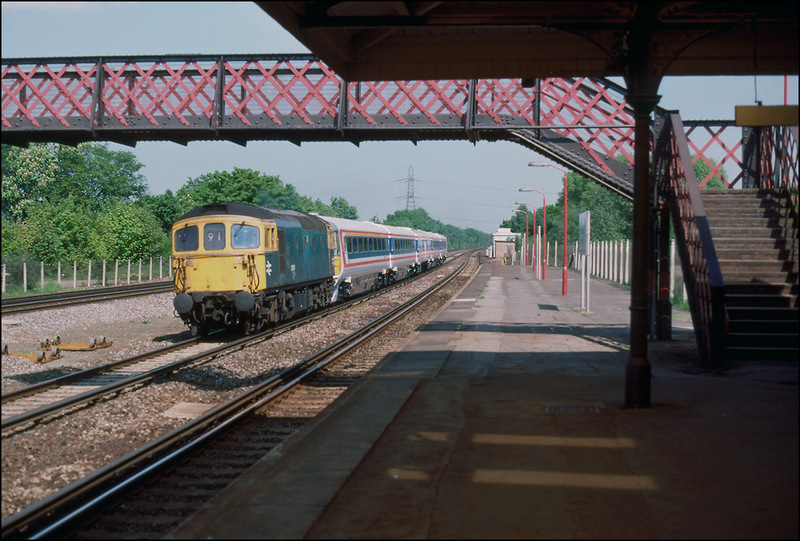 33211 is seen here passing Sidcup on 20 August 1989 with this working. 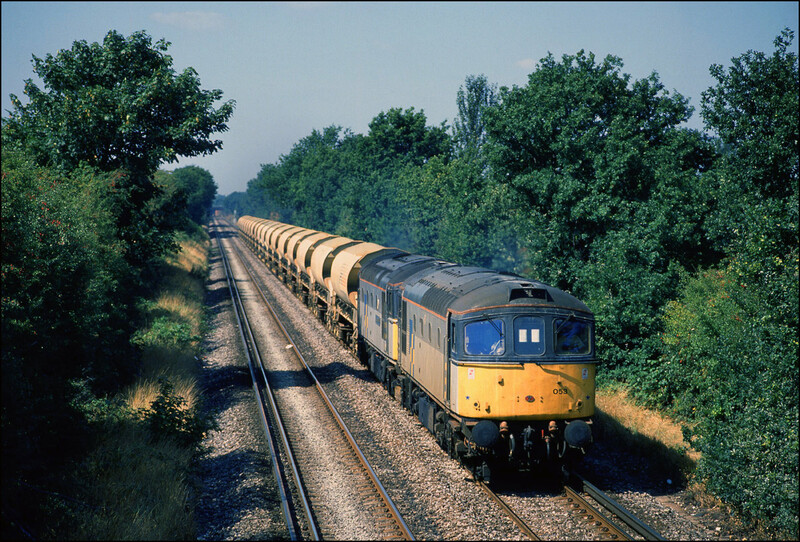 I have previously mentioned the Channel Tunnel construction traffic and here is a view of the empty tunnel segment train storming down the bank at Mottingham on 29 July 1989 behind 33052+33019. This was a Saturday and I made the long trip from Stratford-upon-Avon on the strength of my newly acquired Southern Region Freight Working Timetable. Little did I know that a full Saturday programme of tunnel trains was most unusual, but I did strike lucky on this occasion and scored a full bag of 5 workings. 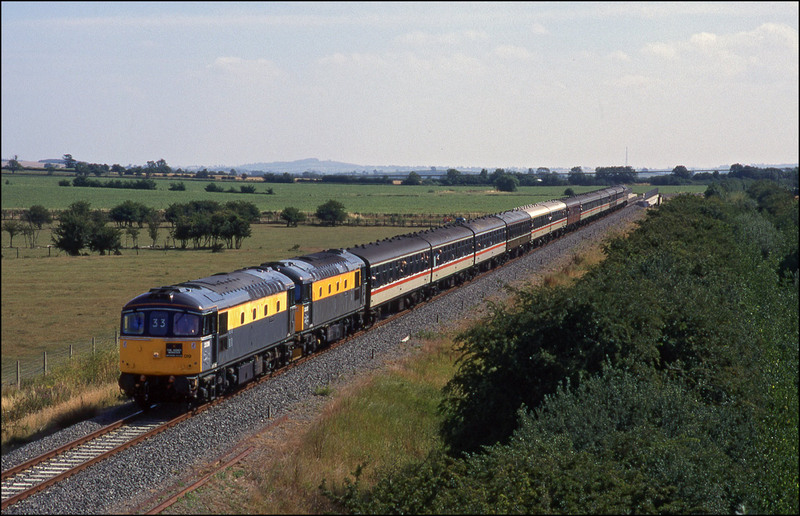 By August 1989 all workings from Exeter, Yeovil and Salisbury were digrammed for class 50 locomotives but it was always possible that a hoover failure might result in a Crompton turning up. 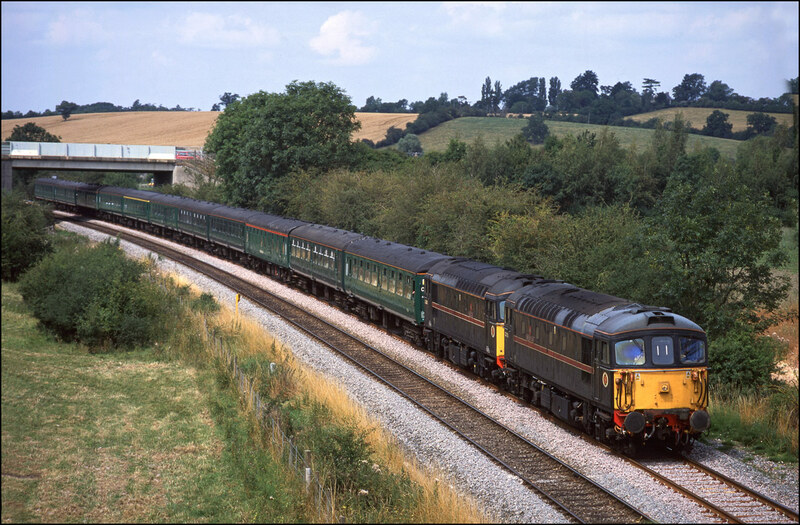 This was the case on 14 August when 33113 was called on to haul the 9.00 Yeovil Junction to Waterloo train. It is pictured here leaving Basingstoke and unusually crossing onto the up relief line which means that, in all probability, it will have a slow journey behind a local unit at least as far as Woking. At 21.32 precisely on 21 May 1988, 33029 leads 31469 past Leamington Spa with a Liverpool to Dover postal train. 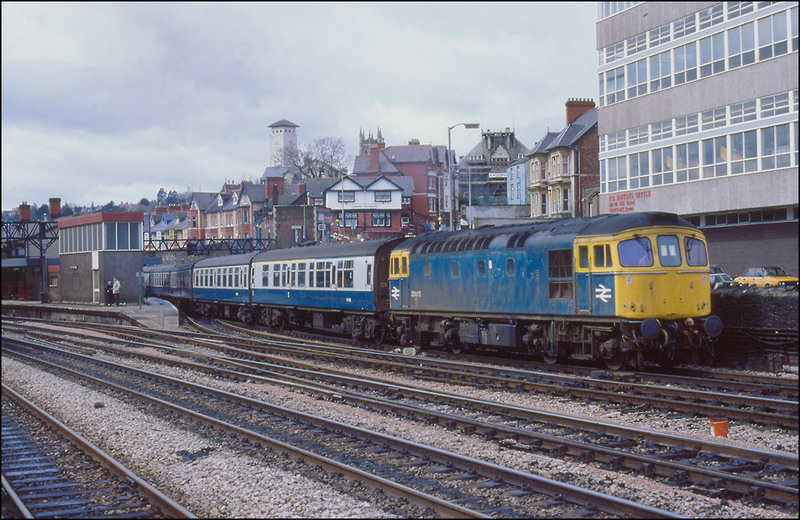 The 33 had previously worked up solo from Tonbridge in Kent with a train to Preston which an AC electric loco would have taken over at Coventry and then been attached to the front of the 31 as a convenient means to return it to the southern. The light was much worse than it looks on this picture which was taken at 1/125 at f2.8 on 400asa film but fortunately, the train having come off the Coventry branch was moving only slowly at this point so a slow shutter speed didn't matter too much. 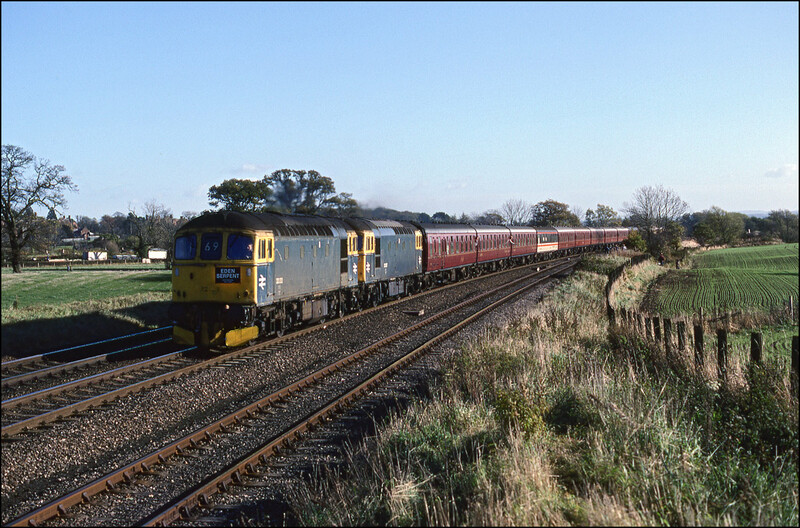 Moving north from Leamington Spa and in somewhat better lighting conditions we find 33202+33207 on "The Eden Serpent" railtour climbing Hatton Bank on 8 November 1986. The use of a pair of "slims" was unusual and made this a "must get" shot. It was booked to run in front of a special hauled by the NRM's Mallard and my master plan was to photograph the cromptons and then march off leaving the hoardes of kettle photters to do their thing clearly showing my disdain for all ferroequinological coal-burners. Sadly, things didn't work out and the kettle came first. It was nearly good though, as several trespassing chasers hurrying away for another shot of Mallard were within inches of being transformed into an interesting headboard by the 33s following only a section behind. 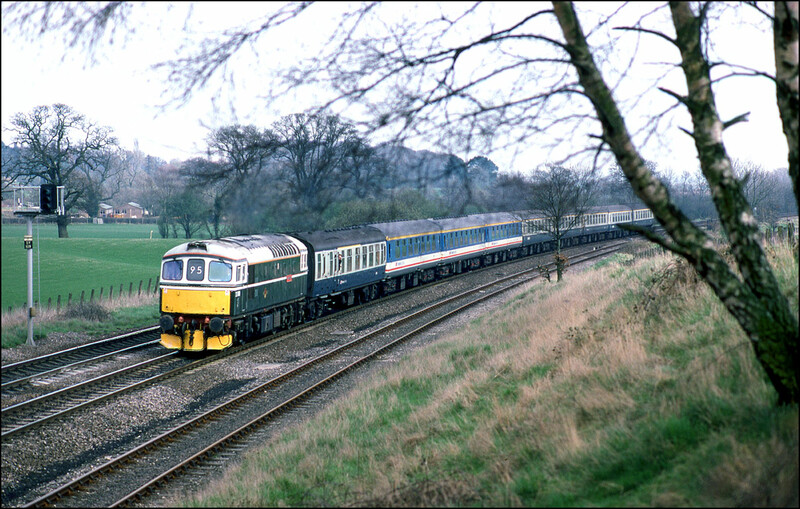 This photograph shows one of the first celebrity diesels repainted into an approximation of the original 1960s livery. 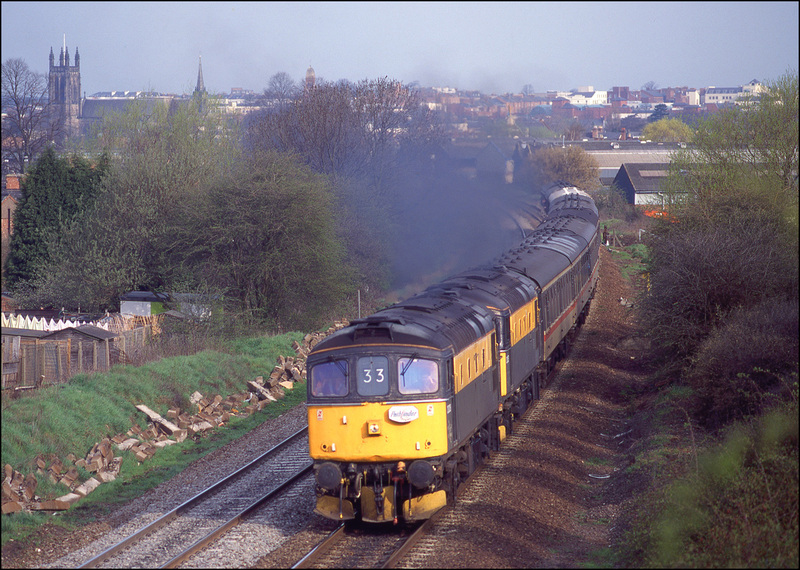 It is, of course, 33008 climbing Hatton Bank with a Poole to York relief service 16 April 1987. The train was not booked to call at, and therefore reverse at Reading, travelling instead via Reading West Curve. Because of this, it was a fair bet that a Crompton would be diagrammed and it was certainly worth taking an afternoon off work. The light wasn't brilliant but the result was still pleasing. The few days between Christmas and New Year 1990 marked a nadir in the availabilty of the class 50s diagrammed on Waterloo to Salisbury and Exeter trains. "The locos the Southern could never do without" as the Cromptons have been described, once again came to the rescue and performed heroically on these trains. Overall, the weather was not too good over the holiday, but the number of 33 workings helped to get some in the sun. I have many more back & white images and some of these will appear here as time allows. The first shot shows 33101 arriving at Woking on 27 December 1990 with the 11.18 Salisbury to Waterloo. 33114 was a bit of a rare bird at this time but did manage to put in at least one appearance as a 50 replacement on 27 December 1990. It is seen here leaving Woking with the 12.15 Waterloo to Salisbury train. One of the most colourful trains over the Christmas holiday 1990 was this - 33118 + NSE 4TC stock forming the 12.15 Waterloo to Salisbury. It is pictured at Battledown, a few miles west of Basingstoke. A few hundred yards to the east of the previous picture is the footbridge over the line at Worting. This has been a popular location for railway enthusiasts for decades and I was a very regular visitor between 1987 and 1991. 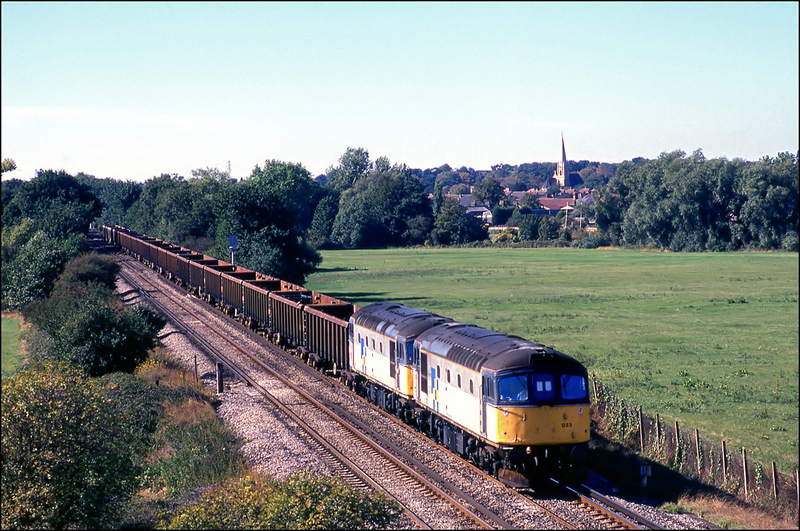 This picture shows 33043 heading west on 14 September 1989 with a trains of large ballast hoppers heading for Eastleigh. 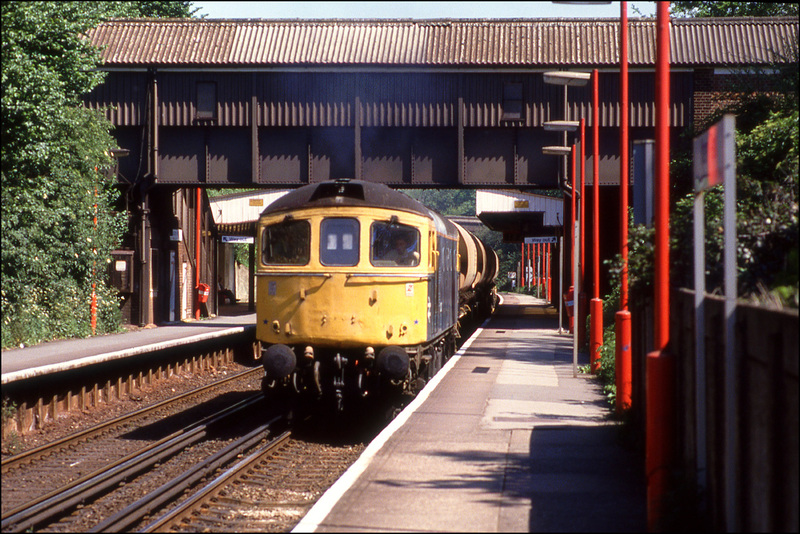 In 1988 it was still possible to photograph and ride upon Crompton-hauled trains between Cardiff and Portsmouth Harbour. On 4 April, 33011 is seen here leaving Salisbury for the coast and passing 202027 waiting to follow it, at least as far as Tunnel Junction, with a service to Basingstoke and Reading. 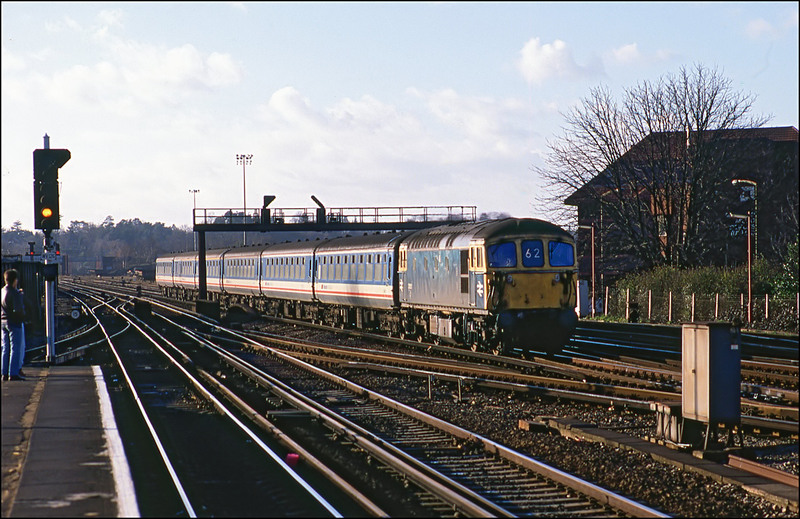 Turning around from the picture above, this is the scene at Salisbury with 33026 arriving with a train from Portsmouth Harbour on 4 April 1988. 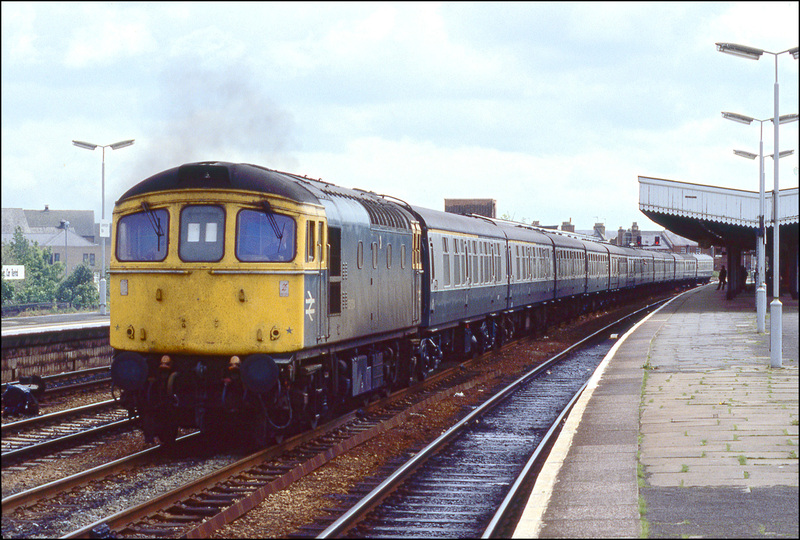 33009 was photographed arriving at Salisbury from Cardiff on 4 April 1988 with a train for Portsmouth Harbour. Whilst in the platform, the locomotive overheated and it's cooling system had to be replenished by station staff with a chain of watering cans.